I found so much stuff on Monday and Tuesday that I was almost relieved to come up empty the rest of the week. I knew this summer was going to be busy, but I’m just realizing now that it’s going to be busier than ever before. 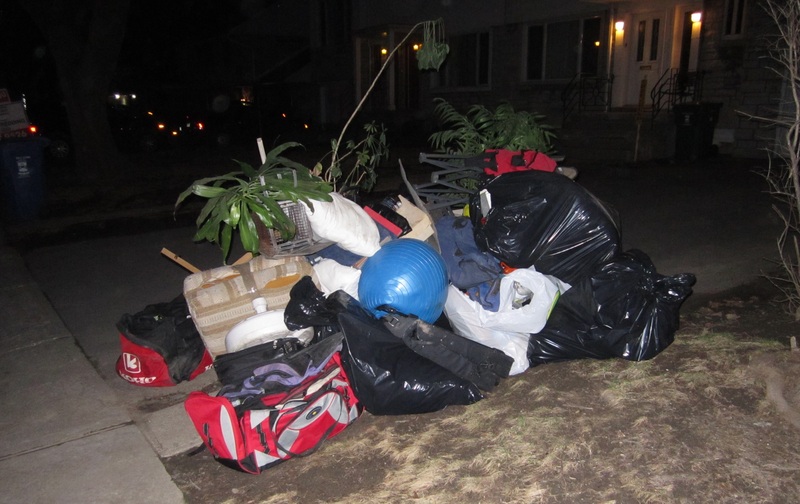 This is mainly due to the fact that I’m a much better trash picker now, and I anticipate finding a lot more stuff. This realization is part exciting, part terrifying. I look forward to finding more cool things, but I’m also worried that I’ll end up working way more than I like. I haven’t tracked how much I work exactly, but I estimate I already put in around 50-60 hours a week. Each blog post alone takes about 25 hours to produce after all the work that goes into it. I won’t lie, when I feel most burnt out I fantasize about the fairly normal – even lax – work week I’d have if not for writing this blog. For the record, the blog is a mostly not-for-profit affair to spread awareness and act as a record of what I’ve found. Tips are gratefully accepted and help pay for the maintenance of the site. Regardless of whether I make money from the blog, I enjoy writing it too much to stop. I’ll just have to figure out another way to reduce my workload. Should I buy a new, more expensive camera in the hopes that it’ll reduce the amount of time I spend on photo editing? Should I change the way I write the blog, perhaps including fewer finds or focusing more on the best? Should I take more photos outside, so that I don’t have to bring everything upstairs for a more “perfect” shot? Or maybe I should just take home less stuff? I’ll consider my options in the coming days. I’d appreciate any input you might have as well – let me know what you think in the comments! The week began at my spot in NDG. It’s been producing for quite some time now. 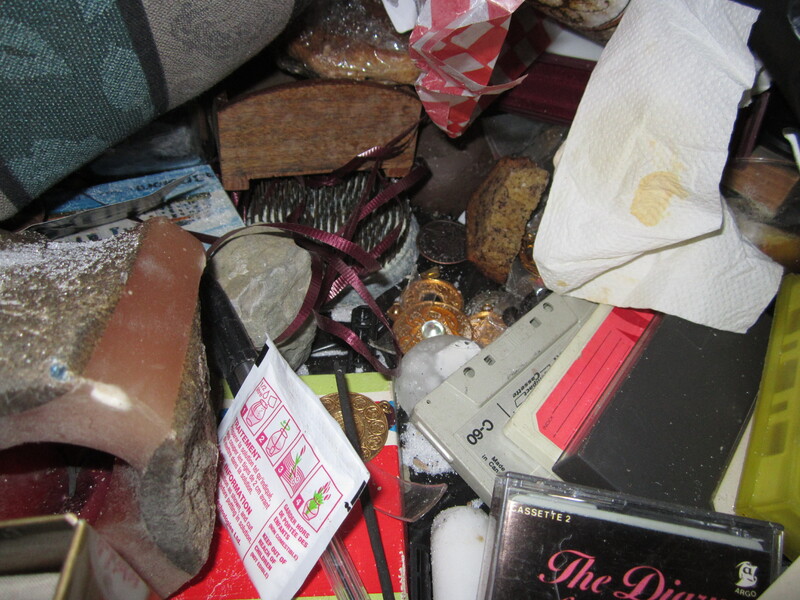 Inside one of the bags was a shoebox full of objects, most of which looked to be related to new age spirituality and different ancient mythologies. Many were inside little cloth pouches. The cylinder in the center looks like it’s meant to hold a scroll. It seems like it’s silver plate. 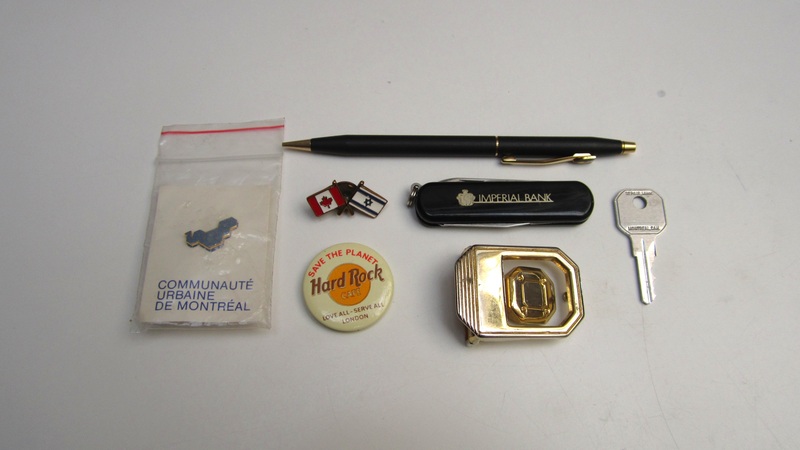 … a loonie in a bag with flecks of some kind of stone, perhaps mica (top right), a mysterious gold color rock (bottom left, about an inch long for reference), and a small pyramid figurine (below). I’m not sure what a lot of the rest is – if you do, let us know in the comments! 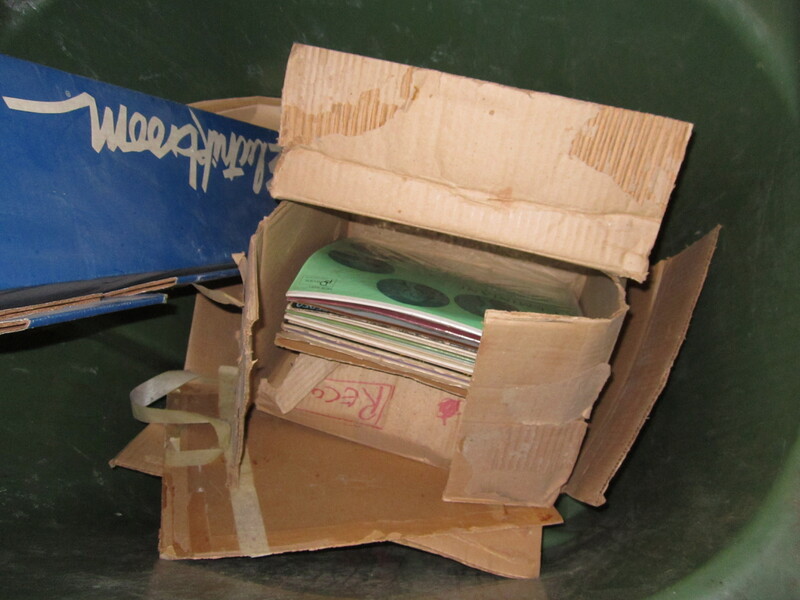 I also made some great finds in the recycling bin. 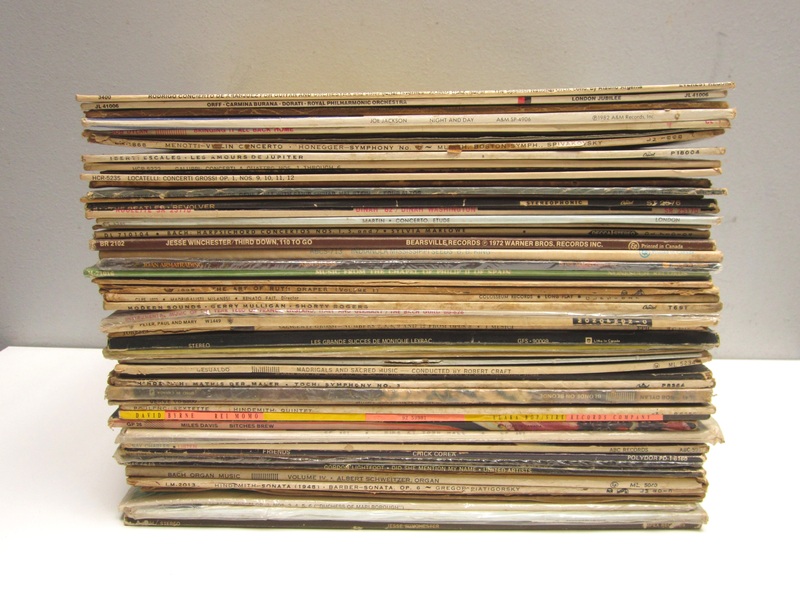 It was a nice stack of records! There were around 60 in all. Most are in great to decent shape. My favourites are the old rock and jazz, some of which I’ve featured below. I’ll definitely add a few of these to my small collection. I already sold three (including the Fugs record below) for 8$. 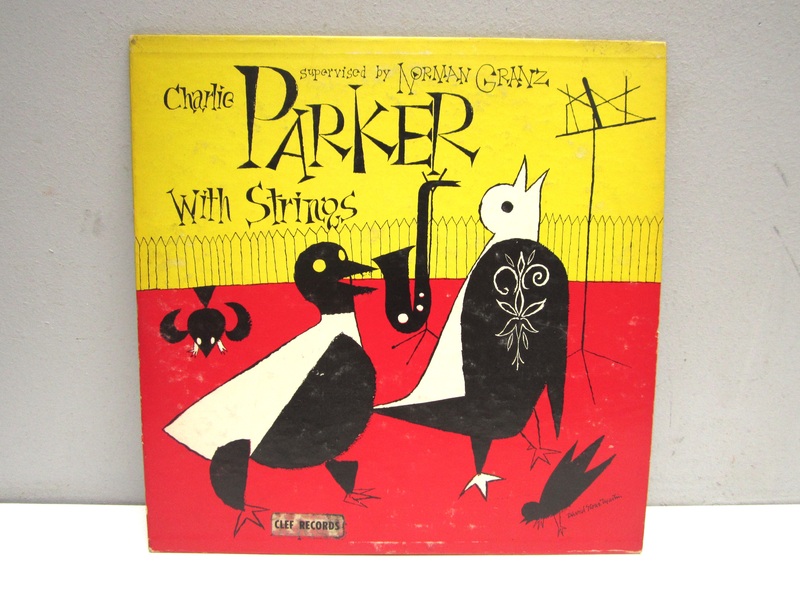 This Charlie Parker 10″ might be the most valuable. 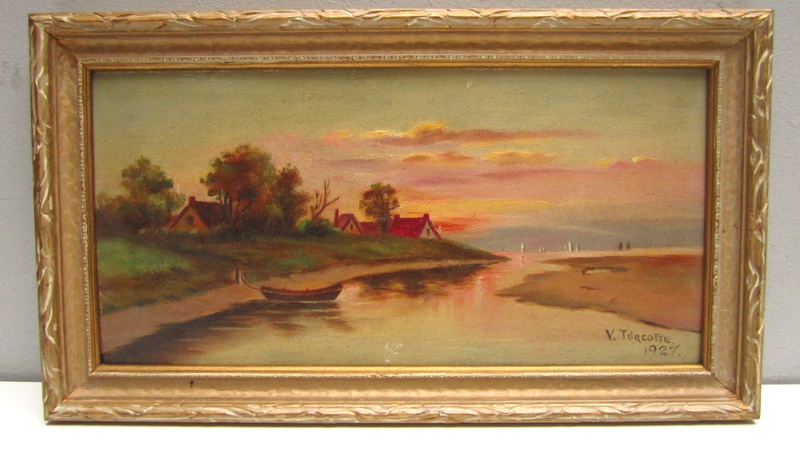 One just like it recently sold at auction for over 100$ . I’d love to keep it, but I also can’t turn down the money. I then made my way to Hampstead. Not long later it starting pouring a very cold rain. I wasn’t really prepared for it, so that wasn’t a lot of fun. 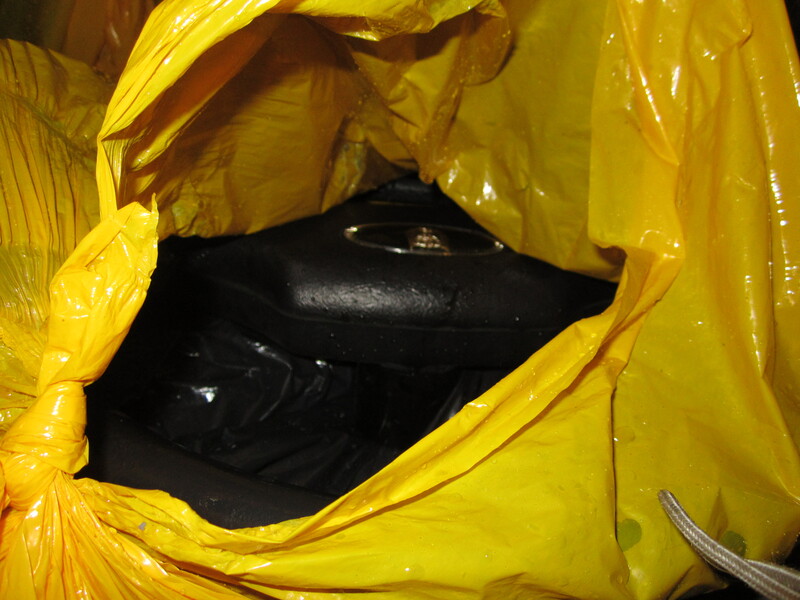 I had to sort through bags on the passenger seat of the car to avoid being soaked. 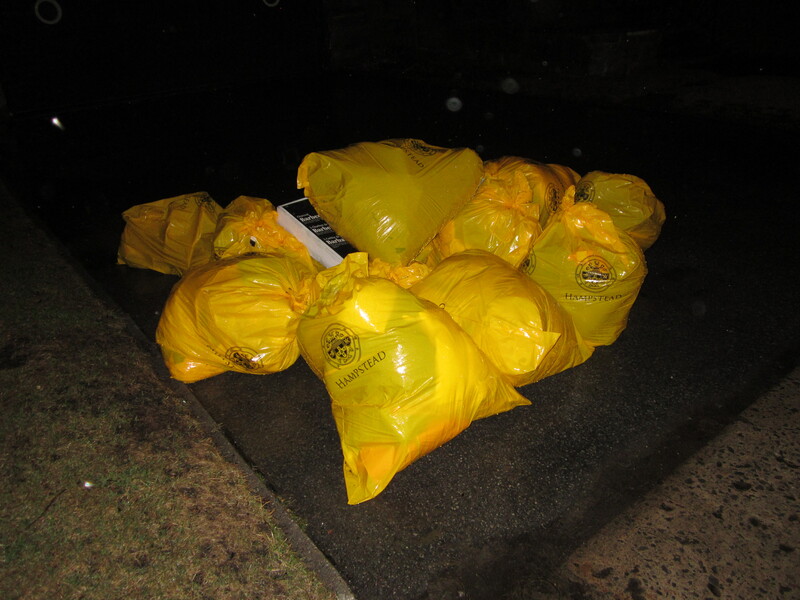 I came across these bags in front of a house that produced a few things for me back in December, but nothing since. A look inside one bag reminded me of times past. One of my first eBay sales – long before I even considered blogging – was a steering wheel and instrument display for a vintage BMW 2002 (a model from the 1970s) that I found in Outremont. 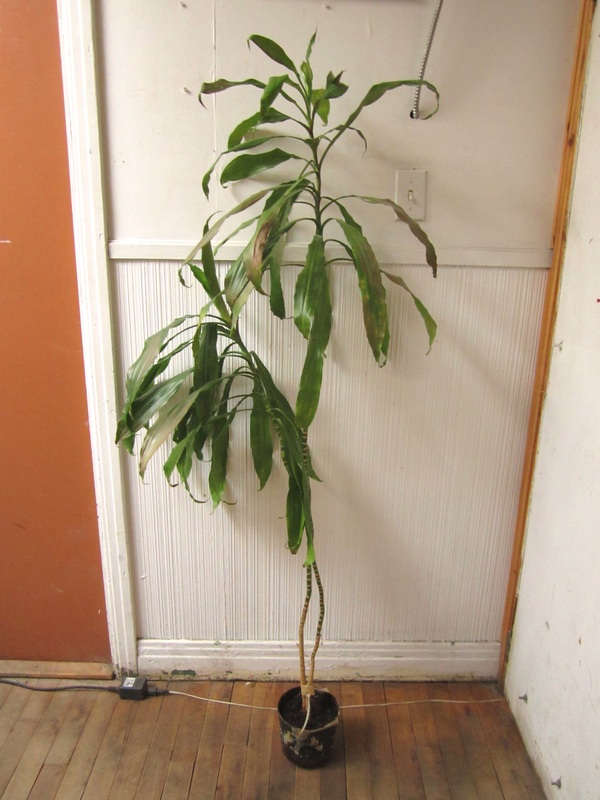 I remember my room-mates thinking I was crazy for bringing them home, figuring they were junk. I showed them! I cleaned them up and sold each for 80$, which at the time felt pretty sweet. 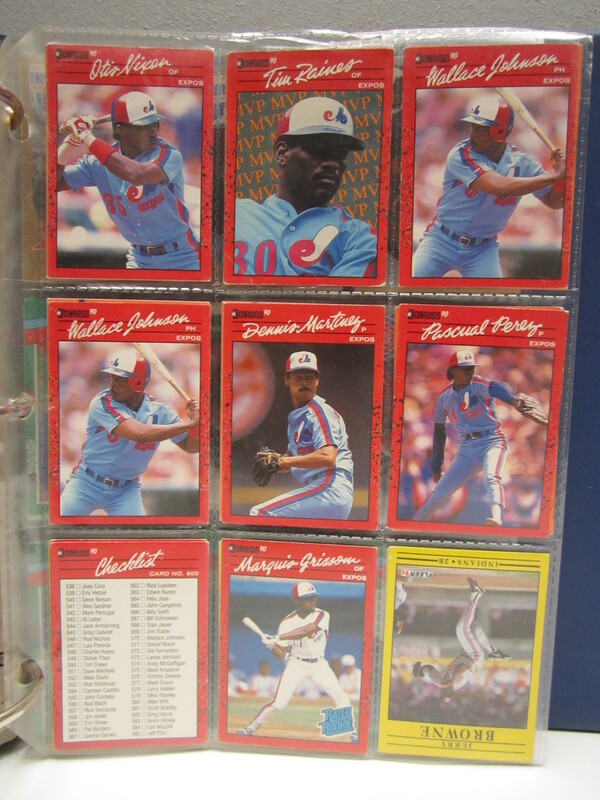 I’m not sure how I figured out they might be worth money (I was a total eBay novice at the time), but I did. 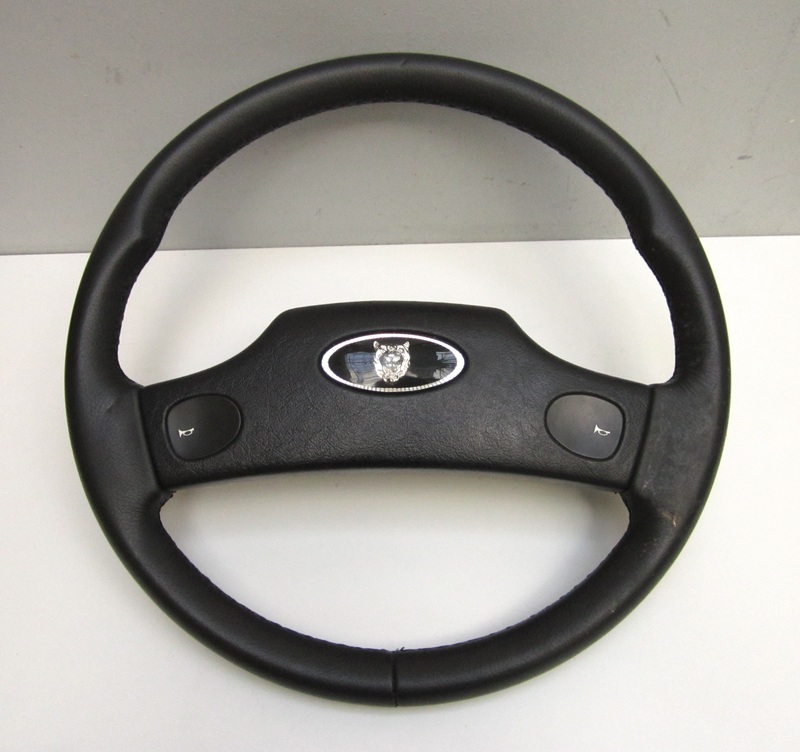 This steering wheel was made for a 1989 Jaguar XJS (it took a while to figure this out), but it will apparently fit a few different models made between 1974 and 1989. One just like it recently sold for over 200$ + shipping . 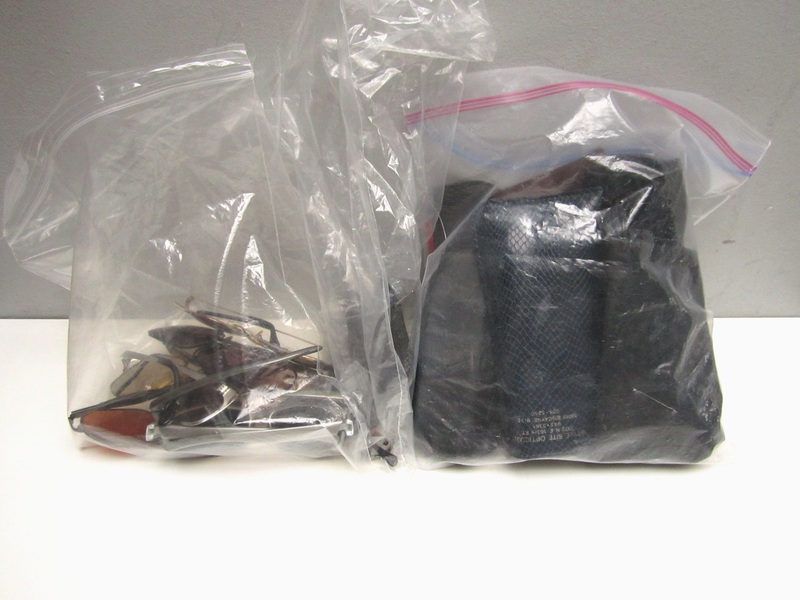 At the bottom of a different bag were two bags full of glasses. 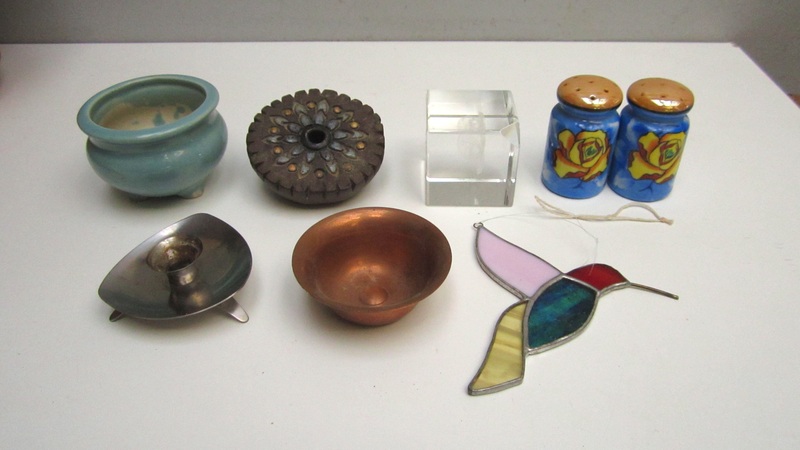 Most are yard sale material, but some might be fairly valuable. 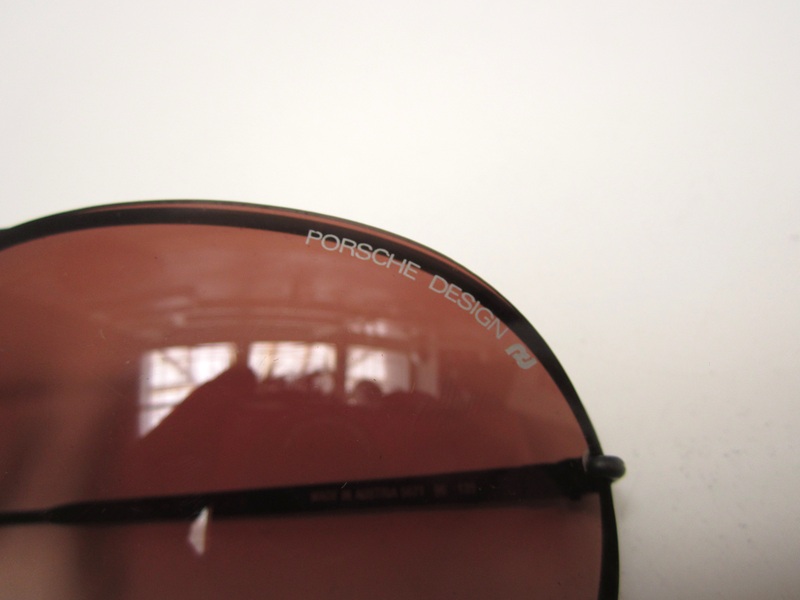 The two at the top and one at bottom left are all “Porsche Design” sunglasses by Carrera. 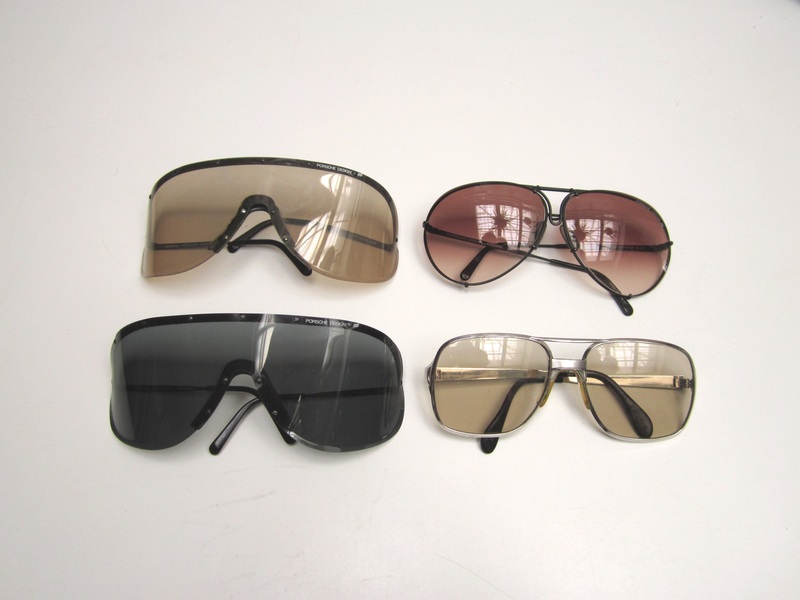 They can go for big bucks, like this pair (most similar to the bottom left) that sold for over 350$ (despite some pretty poor quality photos). That seems to be the upper end of their value, but I wouldn’t be surprised to make 600$ or more from the trio. The sunglasses at the bottom right are by Metzler, and a similar pair recently sold for 50$. .
and a giant Bols gin bottle. This measured around two feet tall! A friend of a friend saw this bottle and fell in love with it and bought it off me for 20$. I’m always happy when I make a quick sale. Tuesday night brought me to Mount Royal. 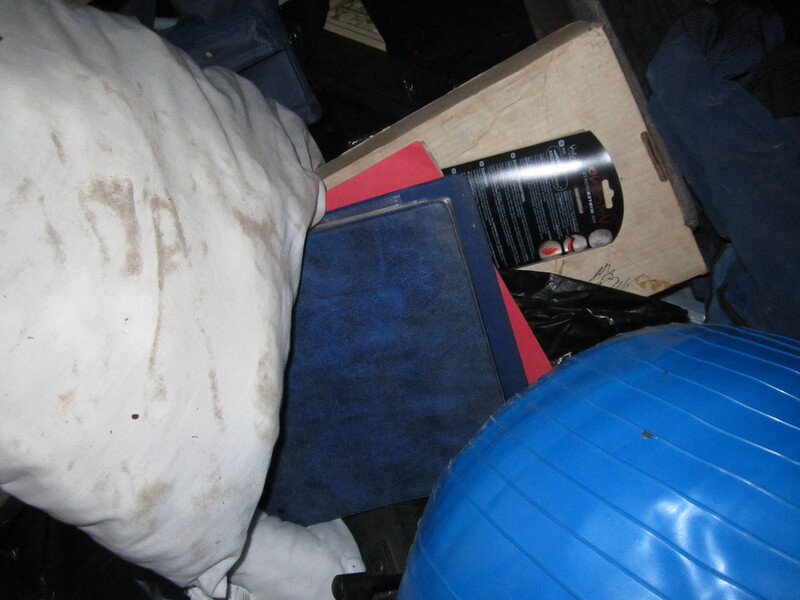 I came across this large pile while driving down a road I cover less regularly than most. It looked to be moving-related trash. A few binders were sitting on top of the pile. 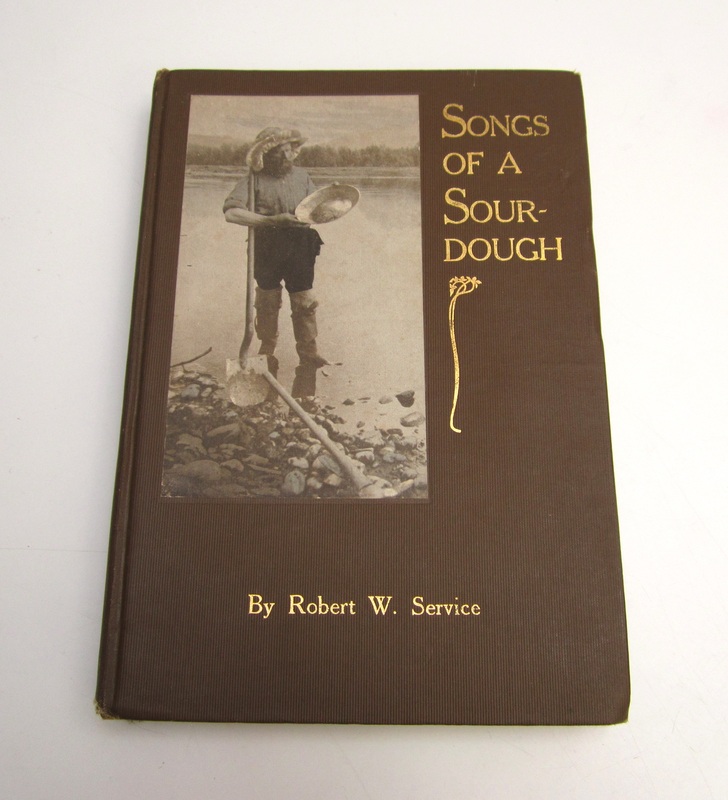 many of which featured local legends. They’re not worth much, but they’re a fun thing to have at yard sales. and a few different potted plants. Most were healthy enough, but the majority desperately need larger pots. We’ve been wanting more plants at home for a while, and these fit the bill just fine! This spot produced some of the most notable finds of the week. I saw a machine of some kind in a box at the top of the pile. I didn’t really look at it much, but I put it in the car because it was super heavy and I figured it might be valuable. It ended up being an espresso maker. A solid one at that! It works totally fine, and doesn’t seem like it was used much at all. 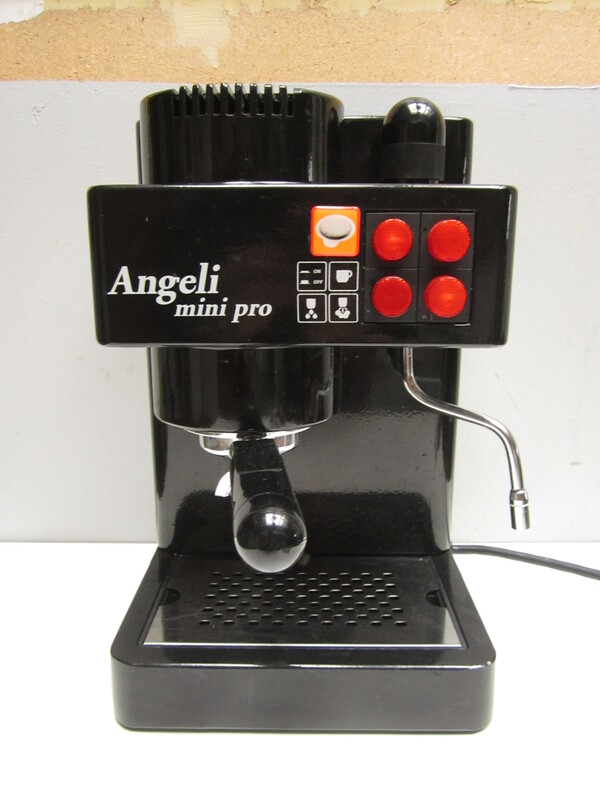 It’s an Angeli Mini-Pro, which is apparently a re-branded Brasilia Lady. From what I can tell this machine costs at least 200$, and often goes for more. Everyone at my house loves a good cup of coffee, so I think we’ll keep it around for our own use. 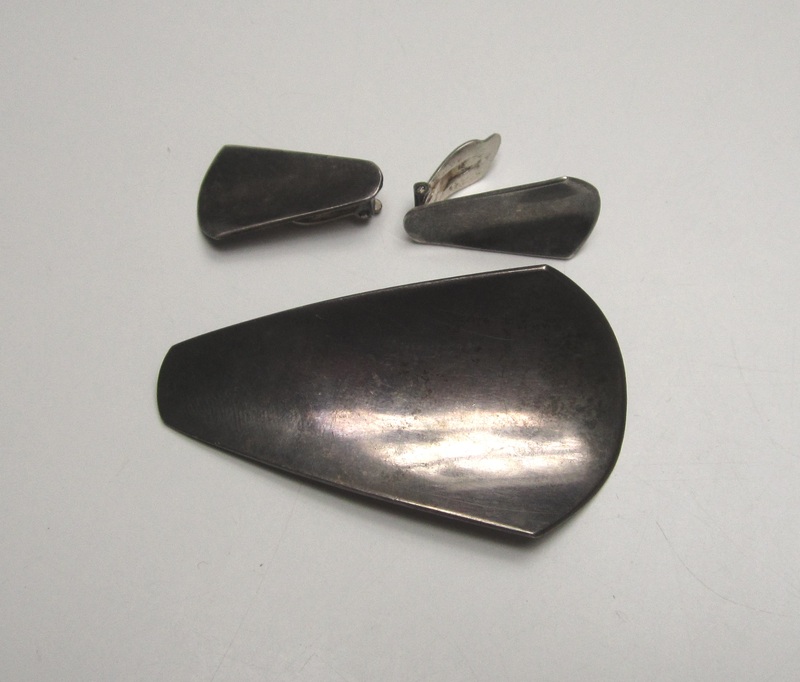 There was another espresso machine (a Saeco Magic) in the pile, but it’s missing the part that holds the coffee. I haven’t tested it yet either. 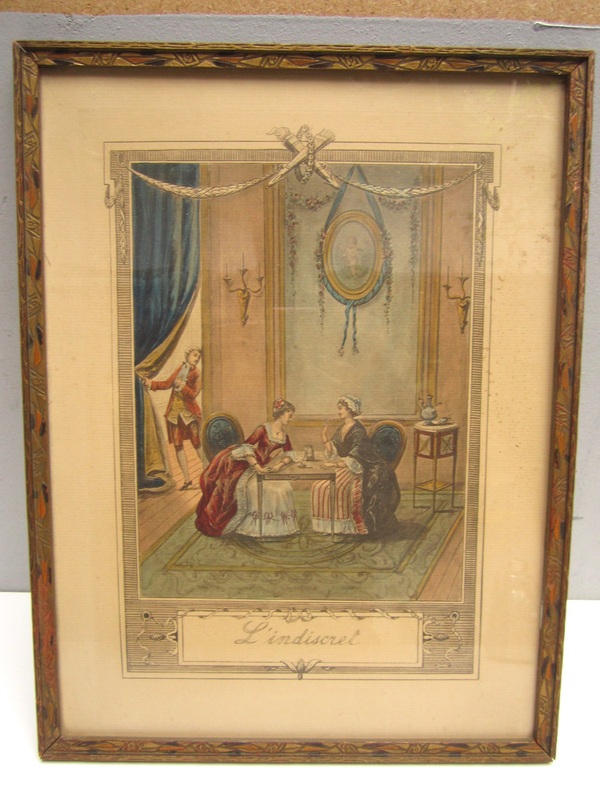 and a print (titled “L’indiscret” – or “The Indiscreet” in English) likely made in the early half of the 20th century. 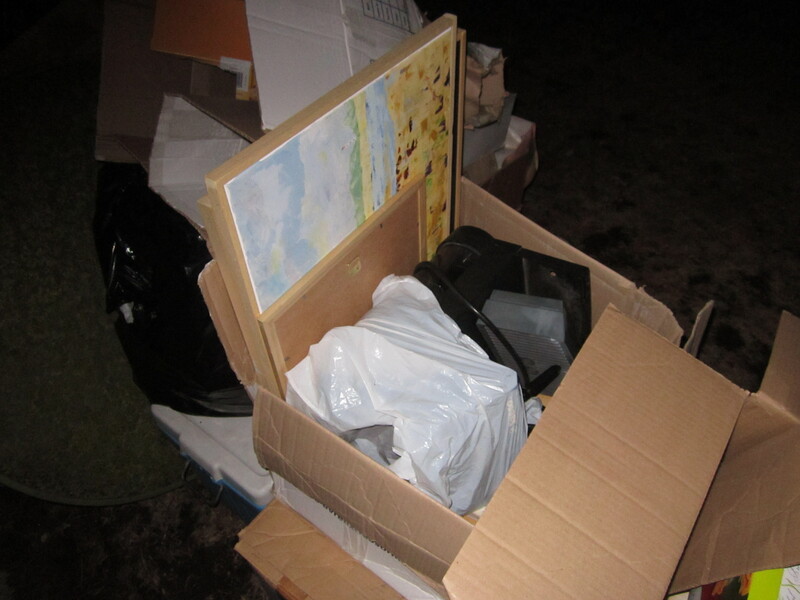 However, I’d say that this huge computer box held the most surprising finds. 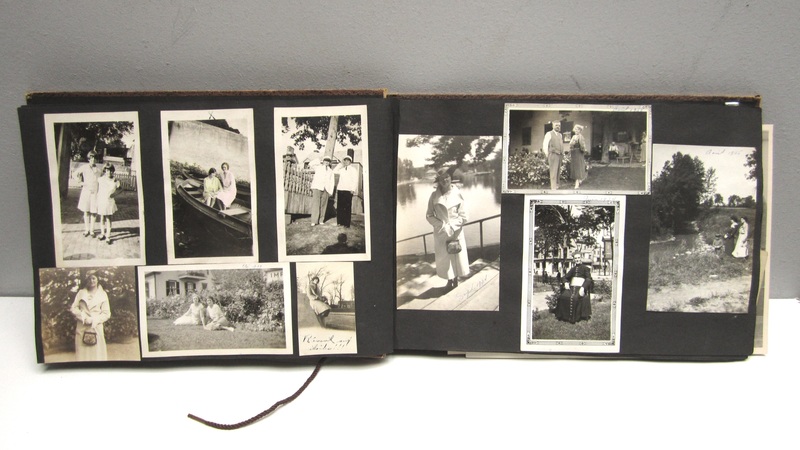 Inside was a massive collection of old photographs, and a few other things. I think it’s the largest collection I’ve ever found in my trash picking career. 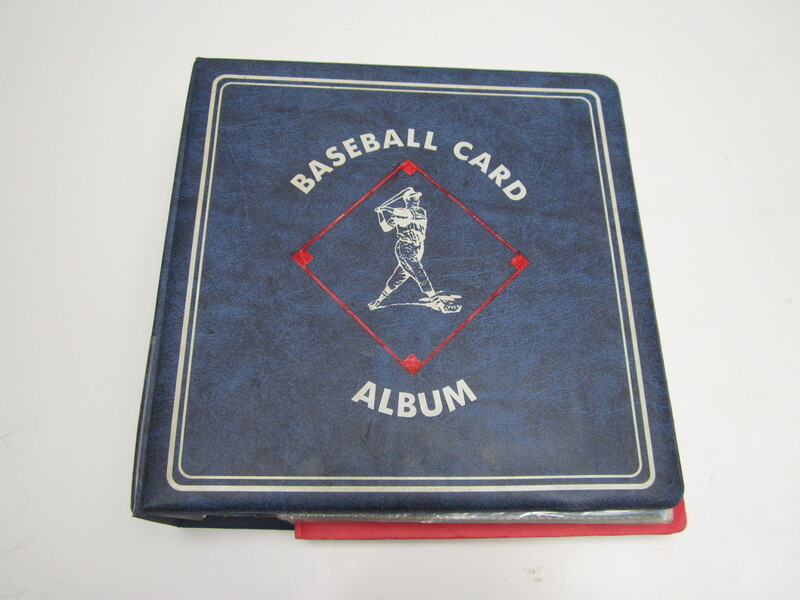 and a few different photo albums, including this one from the 1930s. It’s like someone tossed out their entire family history. This is the kind of find that’s most difficult for me to process. 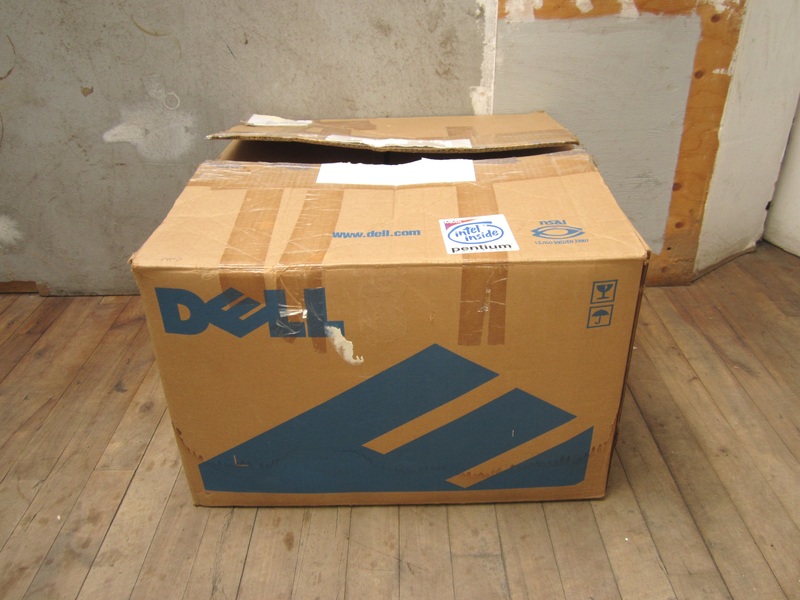 First of all, where do I put this massive box? 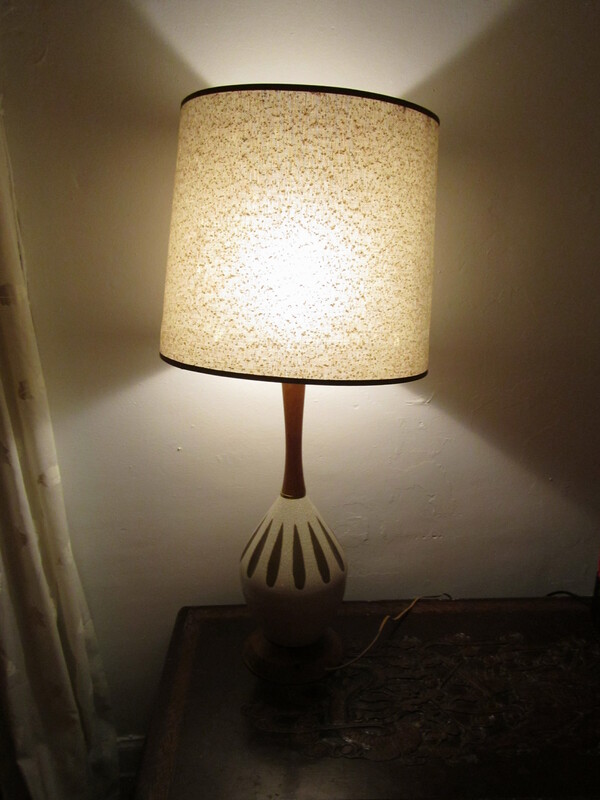 (I stuck it in a corner of the house, which should work for now). Most difficult though might be cherry picking the best things to show you. There’s just so much to choose from, and I can’t even say I’ve looked through it all yet. 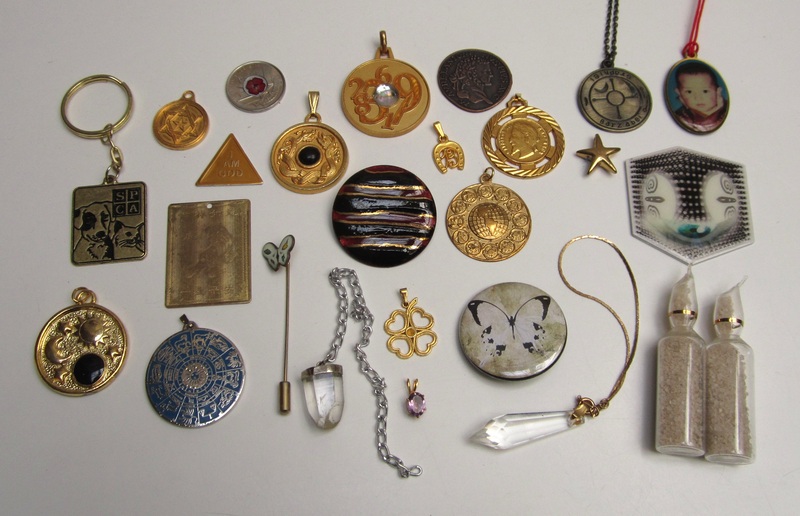 I narrowed the collection down to nine things. 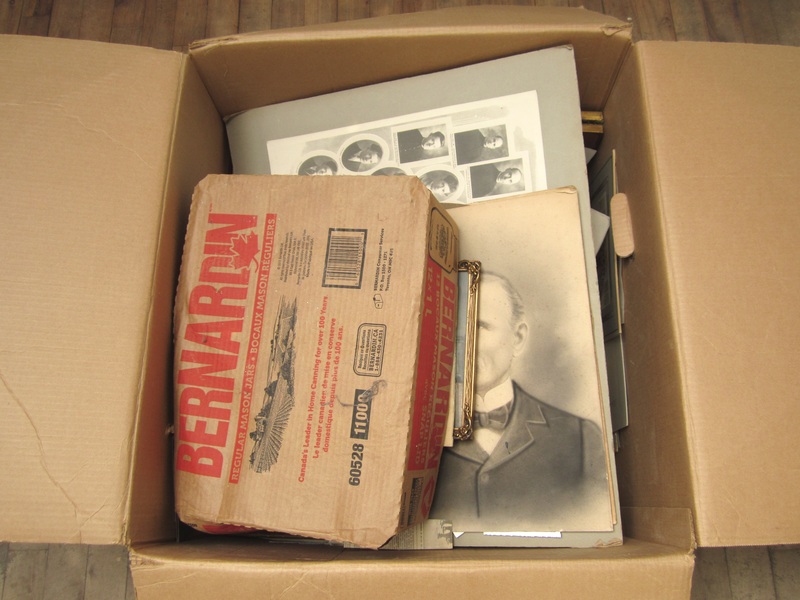 In the large box were a few large sketch portraits. 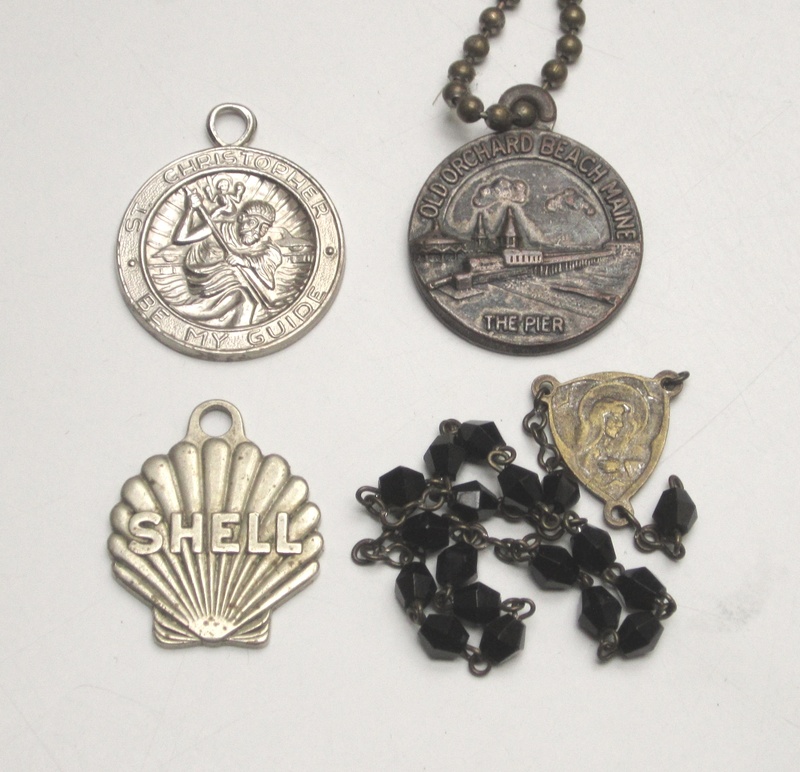 I think these were most popular in the late 1800s and early 1900s. 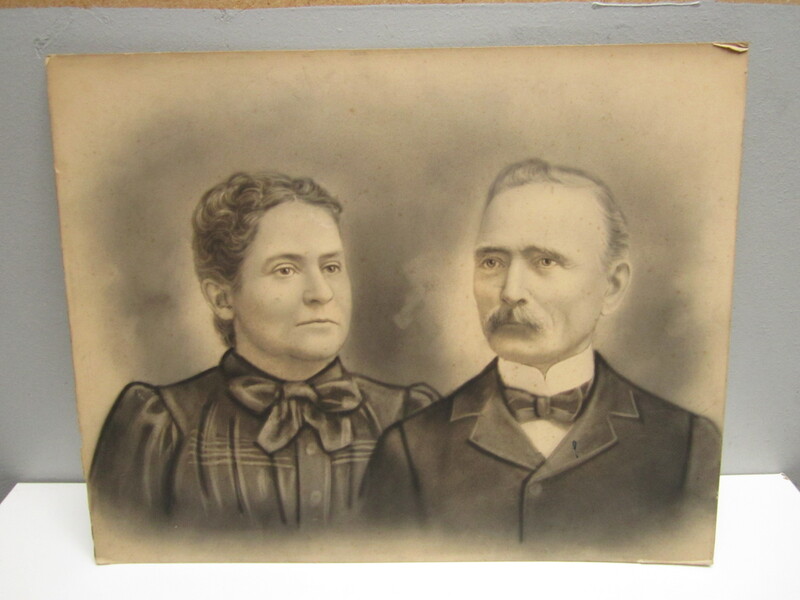 My grandma has two of a similar style featuring my great grandparents. 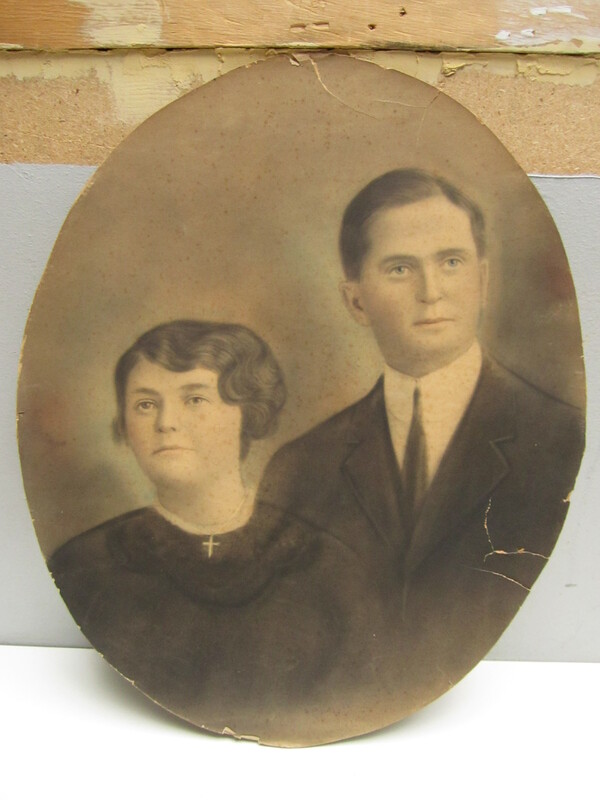 One (of my great grandfather) was made anywhere between 1897 and 1902 while the other (of my great grandmother) is from 1927. 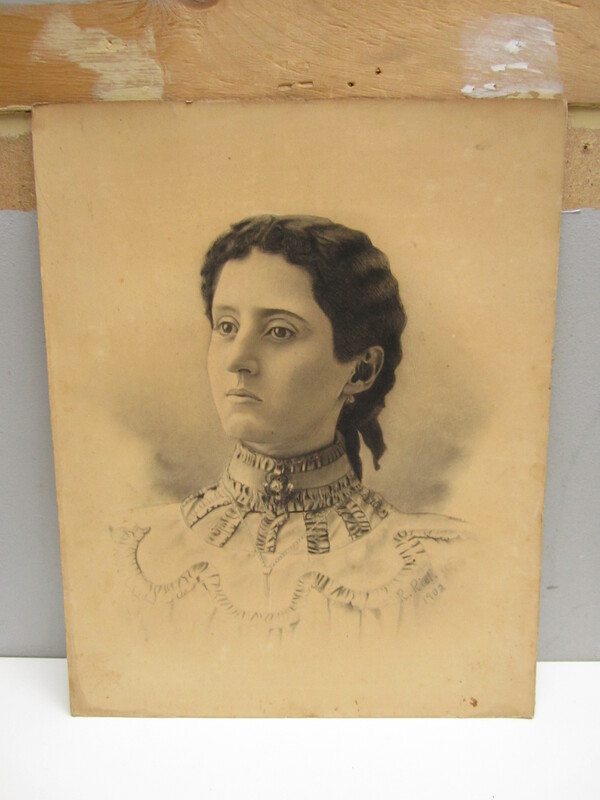 This one’s marked R. Riel, 1902. All of these are quite large, in the 2′ x 1.5′ range. and an engraving titled “The Parrot”. 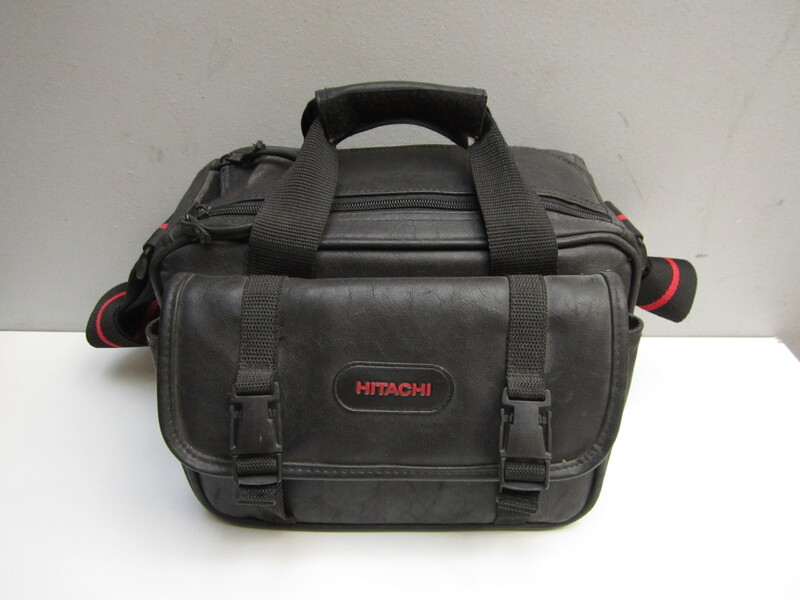 I found a similar one listed on an auction site, with an expected sale price of 300-500$. 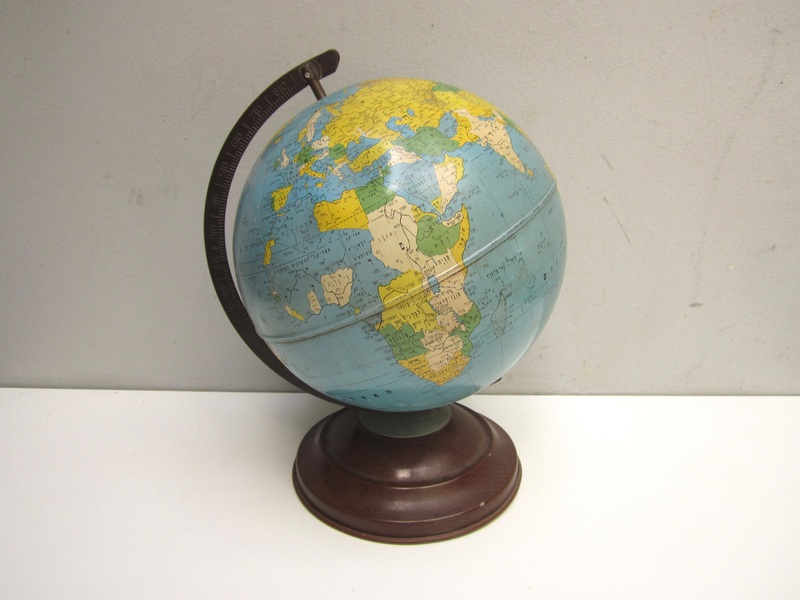 This one has a few bends, but nothing anyone would notice if put in a nice round frame. I haven’t had time to do much more research on it, but it seems like it could be worth a bit of money. 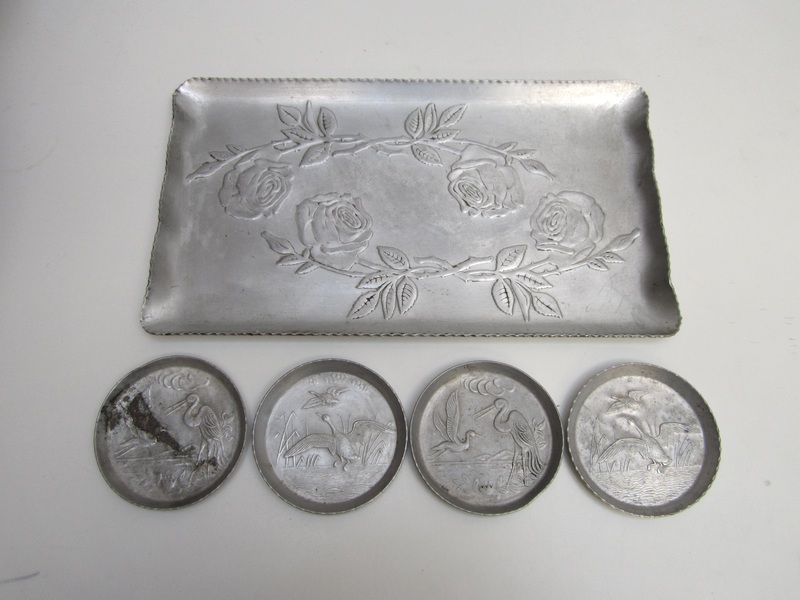 The engraving itself is a bit smaller than the other pieces, at around 8″ wide. and this shot, which is my favourite of the ones I’ve seen thus far. 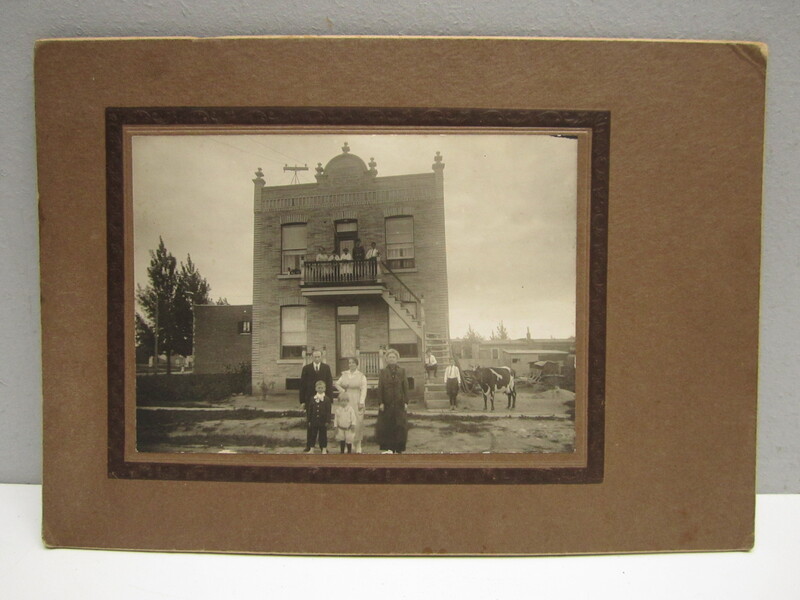 I’d imagine it was shot in the 1910s or 1920s. The house is classic Montreal. The pose of the family is awesome, and the child playing in the background (on the left) is a nice touch. 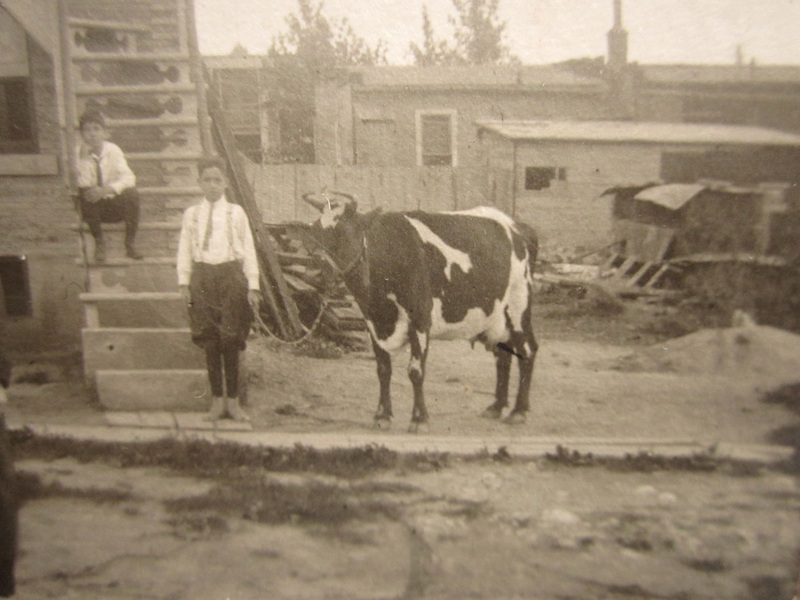 However, my favourite part of the photo might be the cow! 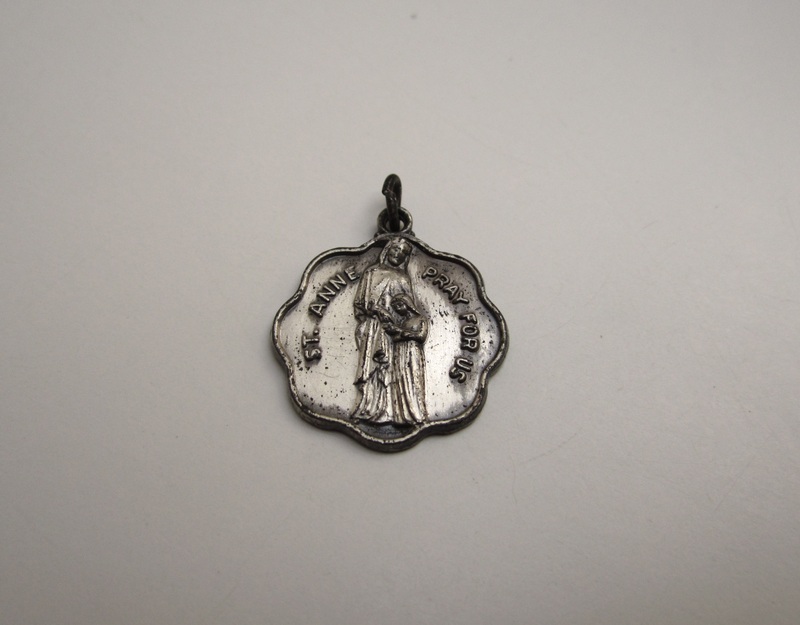 On the back is written “Maison rue Henri Julien.” Henri Julien is a road (named after the Quebec artist and cartoonist who died in 1908) that begins in the Plateau and travels all the way up through Rosemont and Villeray before ending in Ahuntsic. It’s hard to imagine a cow being in any of these places, particularly in the Plateau, in this day and age. My mom was in town for the weekend, and I figured that finding this house would be a cool mission. 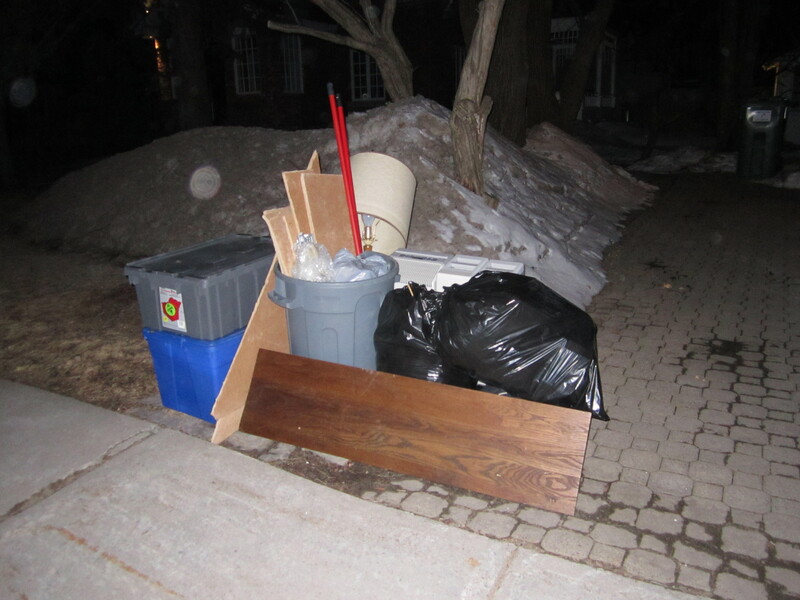 My mom, Sarah and I walked the length of Henri Julien – from Square St Louis in the Plateau to Rue Legendre in Ahunstic – and back again (7km each way), hoping to find the house and take a cool before and after photo. Alas, it was not to be. We never did find the house. 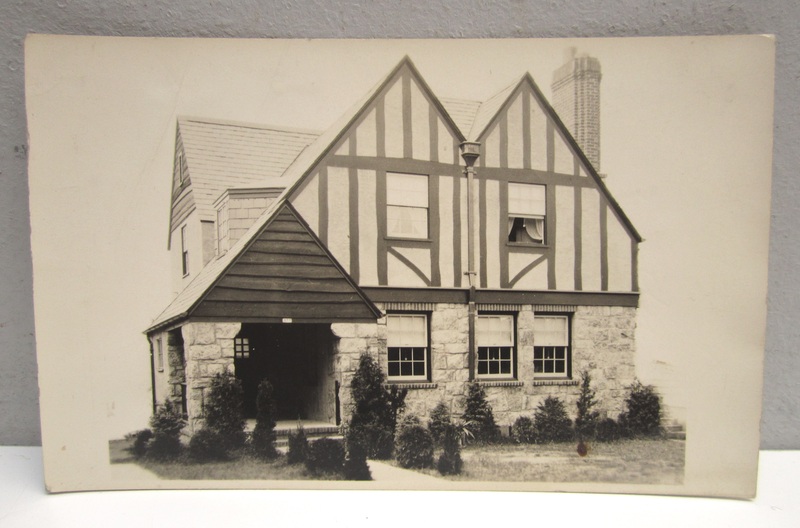 Maybe it was demolished, burned in a fire, or has been renovated beyond recognition. We saw houses that were very similar but nothing that totally matched. It’s a shame, as it would have been a terrific photo. Who knows, maybe we just plain missed it. Regardless, it’s an amazing shot, and one that I hope to scan (for a better quality image) and share. I talked a bit with Sarah about what to do with all these photos. 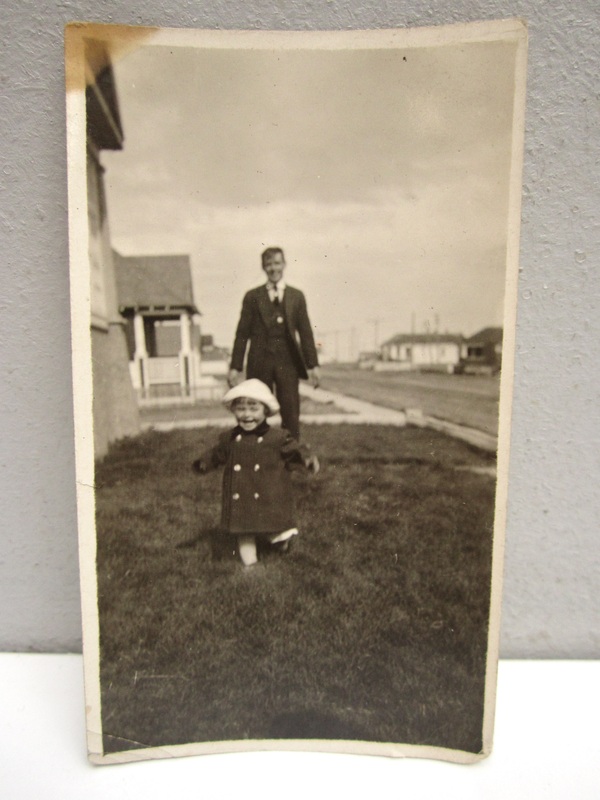 She thinks that they would ideally be scanned and put on genealogy websites, echoing what others have commented here. 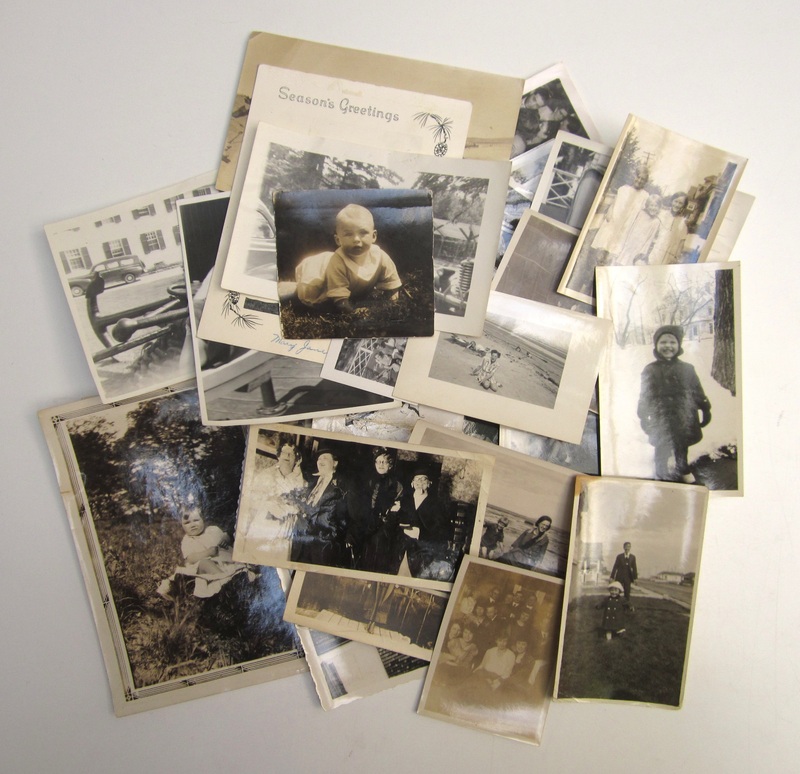 (One great thing about this collection of photos is that whoever originally collected them was very diligent about writing the names on the back!). None of us really has the time to do that, so she proposed trying a Kickstarter campaign to raise funds to pay someone else to do it. Even if we just raised a few hundred dollars that would be enough to upload a couple hundred photos. It’s a great idea, but who knows when I’ll have the time to work on something like that! Do you think it could work? 1. 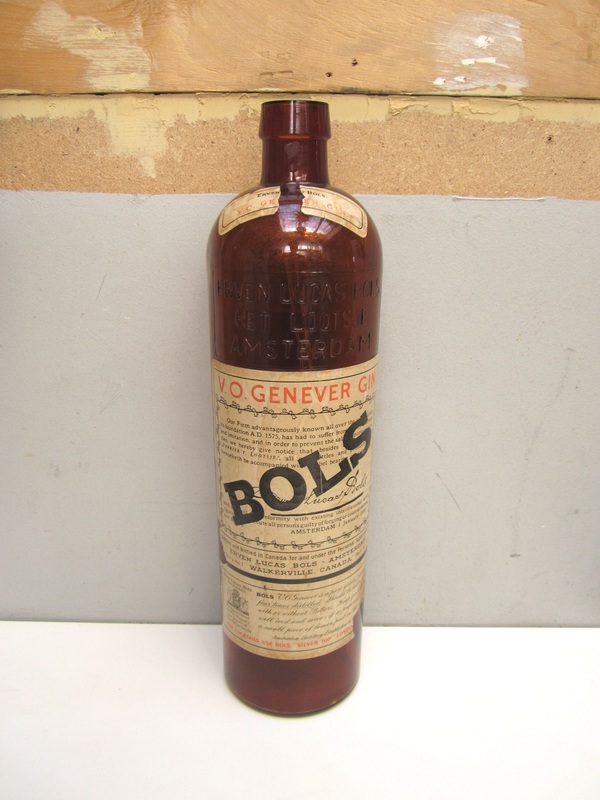 Bols bottle: to a friend for 20$. Found in Hampstead. 2. Records: to friends for 8$. Found in NDG. 3. 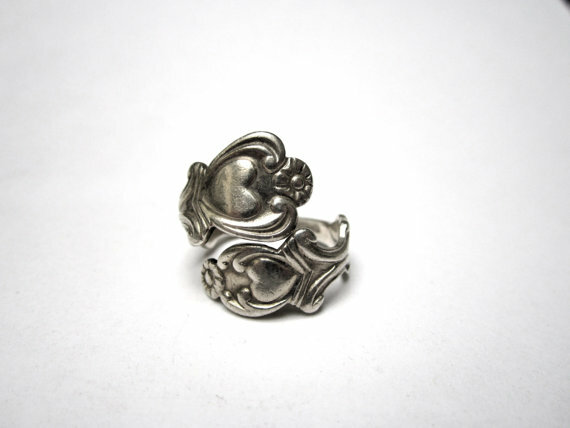 Avon sterling silver spoon ring: On Etsy for 35$. I’ve found two of these rings and sold them both. I forget where this one came from, though. 4. 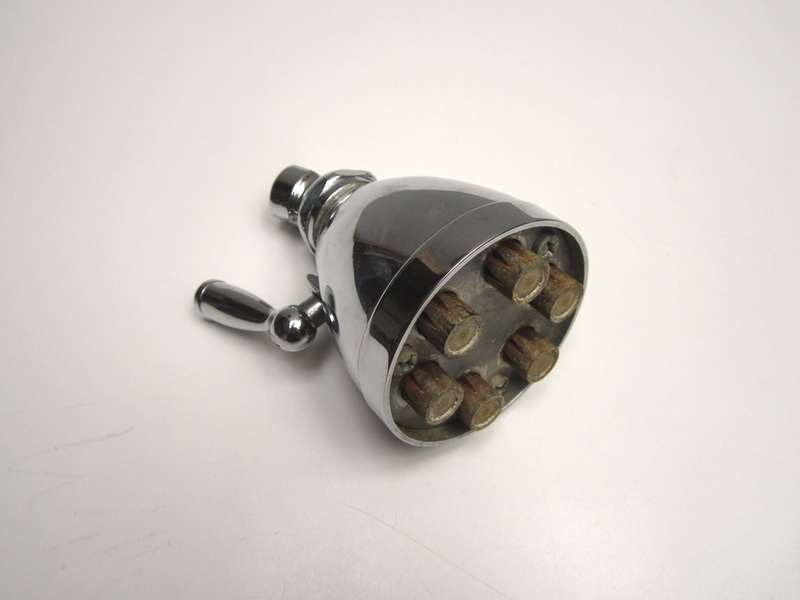 1950s Shell key finder: On eBay for 22$. (Bottom left). Found late February in Verdun. 5. 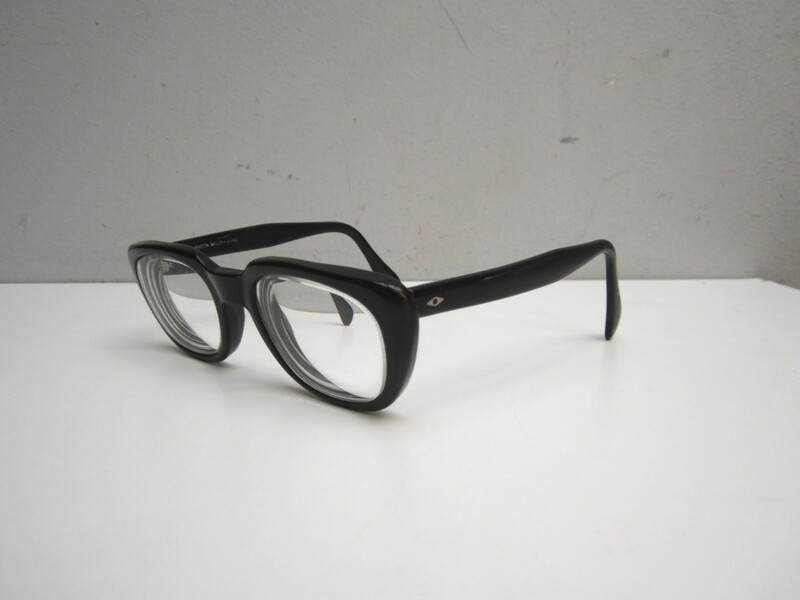 Vintage Martin Wells frames: On eBay for 60$. Found in NDG a little over a month ago. Total: 145$, 15309.75$ since May 18 2014 and 5627.75$ since the new year began. This was my slowest week for sales in a while, but the week before more than made up for it. I refunded the buyer of the perfume bottles 15$ (as discussed last week), which I’ve taken off the total. It wasn’t really my fault (she didn’t read the listing), but I’m not going to get into an argument and risk getting negative feedback for 15$. It’s a negligible amount in the grand scheme of things. 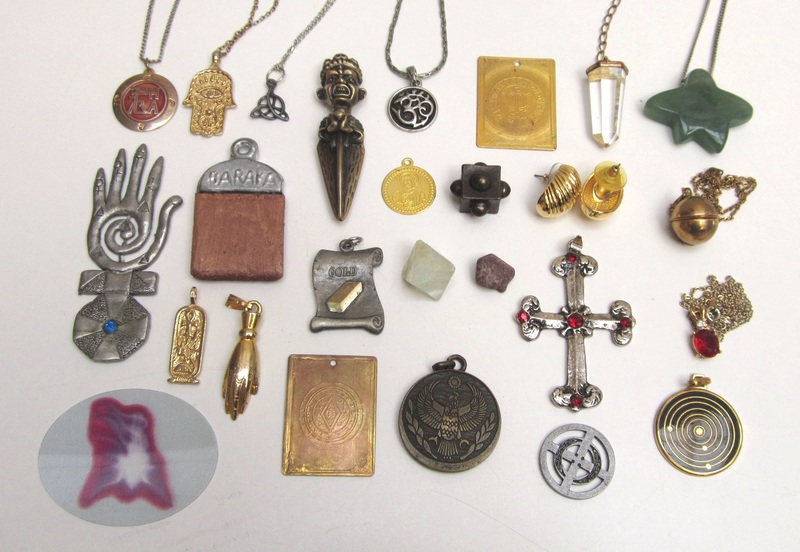 If you have a question, see anything that you’re interesting in buying, or to just want to say hello feel free to email me at thingsifindinthegarbage@gmail.com. I also enjoy reading your comments! I frequently get behind on emails, so I apologize in advance if I take a few days or weeks to get back to you. Last week was a bit slower than usual, but I still made some excellent finds. 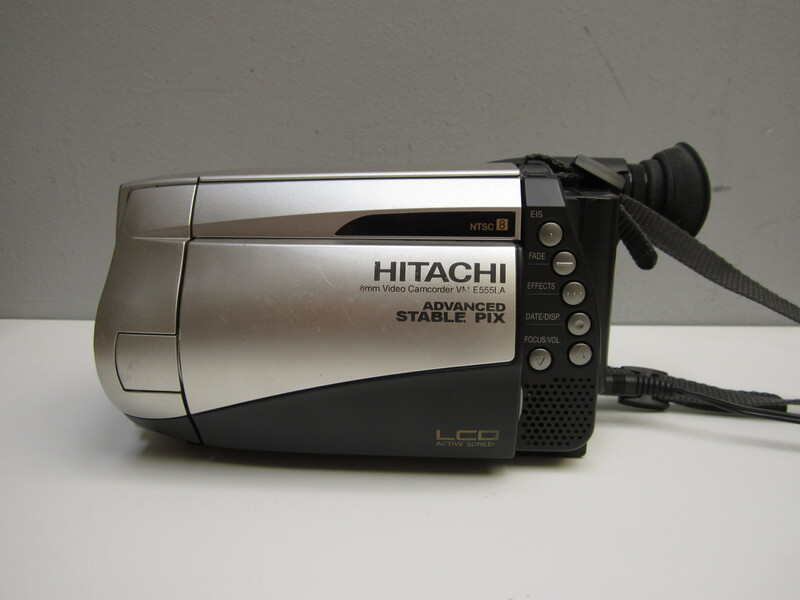 I pulled this Hitachi camcorder out of a bin in Hampstead on Monday – my only notable find of the night. 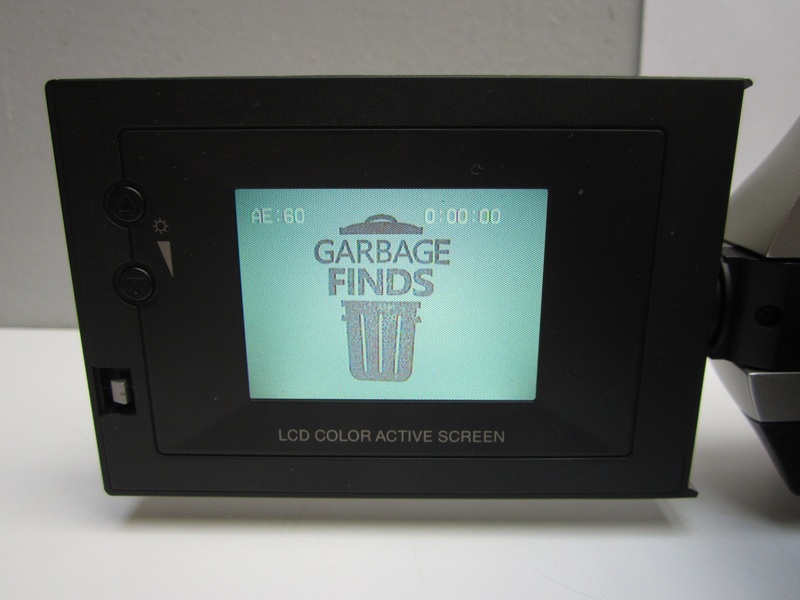 It uses Video 8 film and has an LCD screen. One just like it sold for for 100$ + shipping on eBay. It works fine when plugged in, but the battery is completely dead. However, it costs only 23$ to find a new one on eBay. All in all, this camcorder should net me around 70$. Not bad! 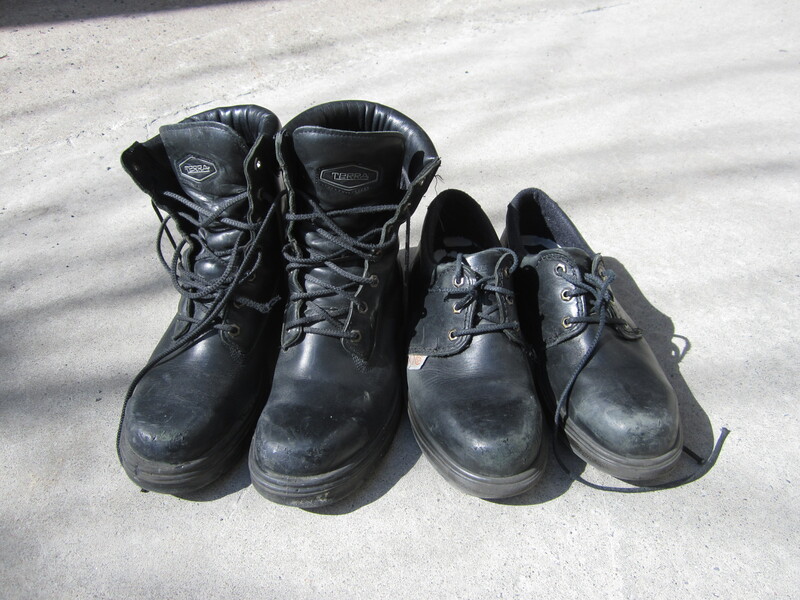 and two nice pairs of boots. I sold one pair at my yard sale this weekend for 5$. 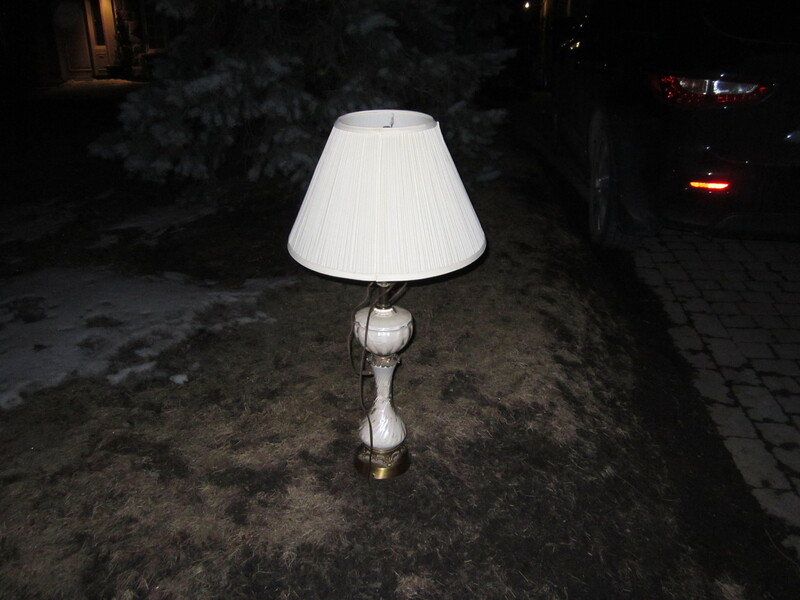 This lamp, also quite nice, sat all by itself in front of a different house. 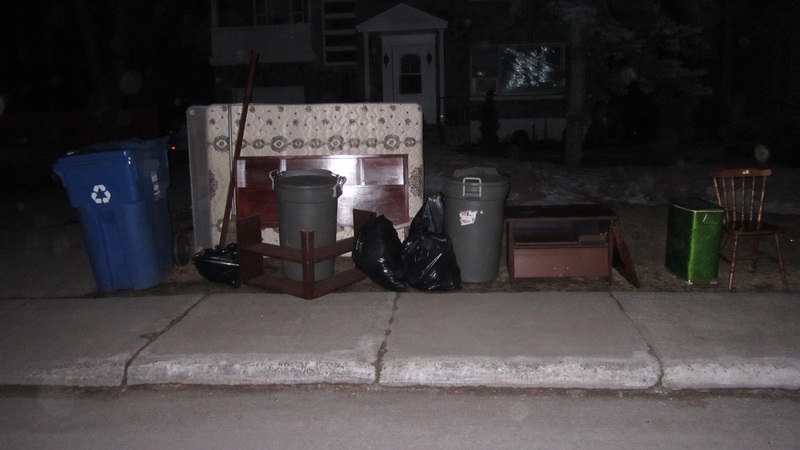 I get the impression that they left it out for someone to find, as there wasn’t a single other thing on the curb. 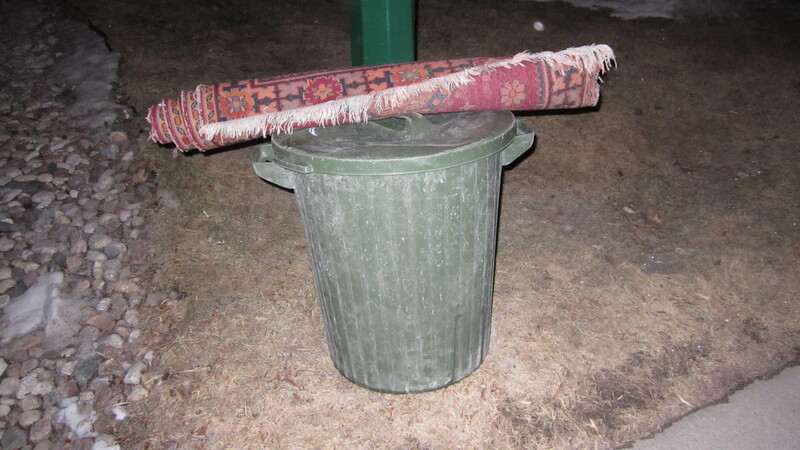 A little carpet sat atop a trash can at yet another place. It was missing the tassels on its longer sides, but was nice looking otherwise. A familiar spot produced my favorite finds of the week, however. I took the laundry basket and the chair on the far right side of the photo. 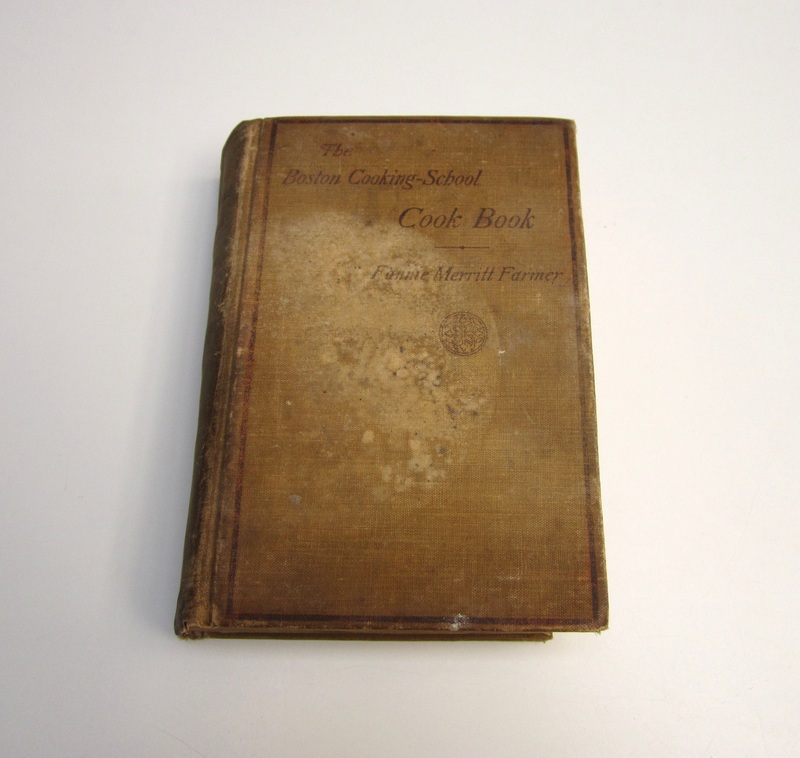 and a 1913 Boston cooking school cook book. 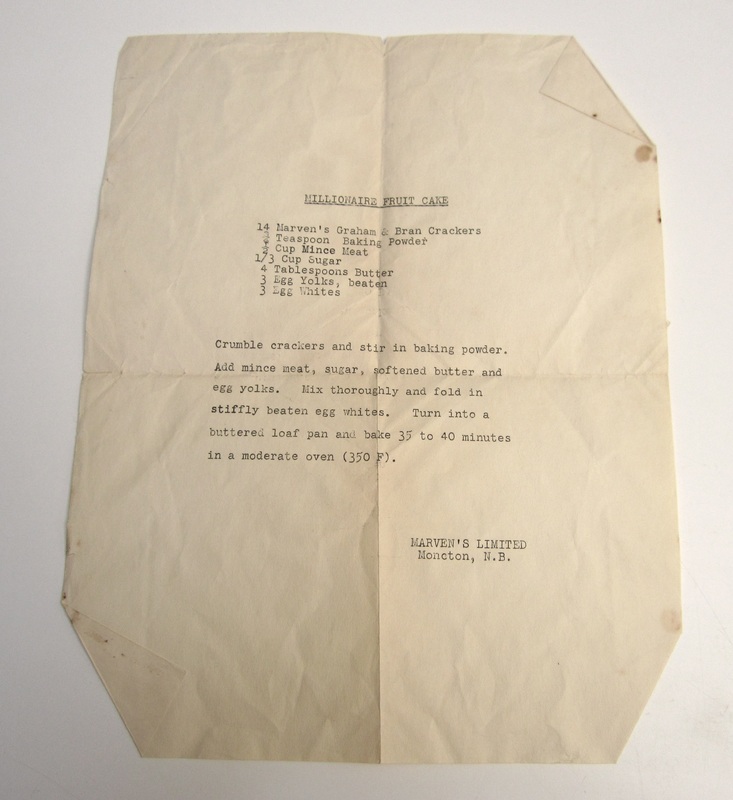 Inside the front cover of the cook book was this “Millionaire Fruit Cake” recipe, which curiously contains no fruit and calls for mince meat. It was written in type by Marven’s Limited of Moncton, New Brunswick. 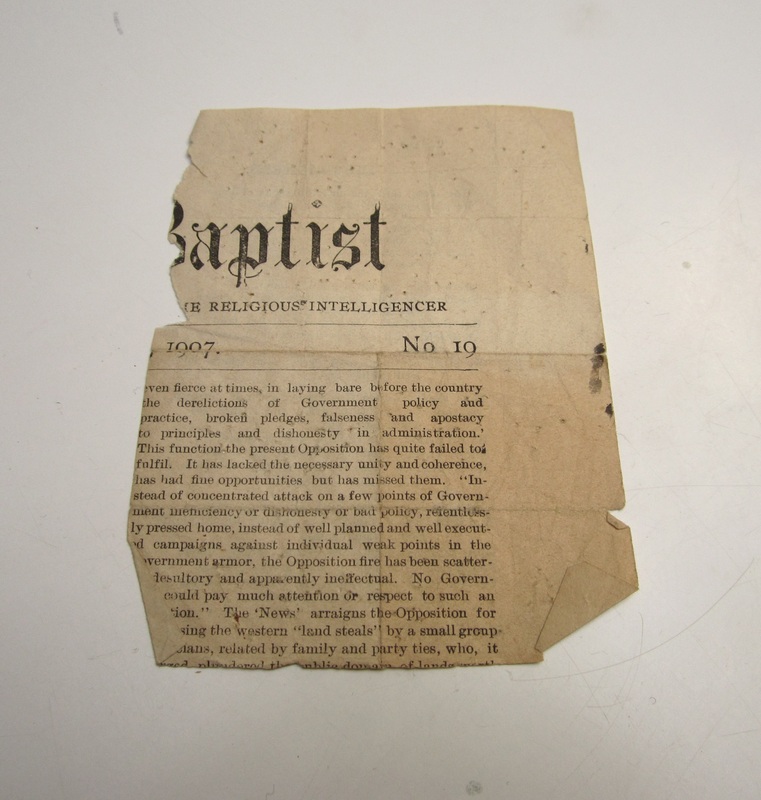 which was cut out of some kind of religious newspaper in 1907. 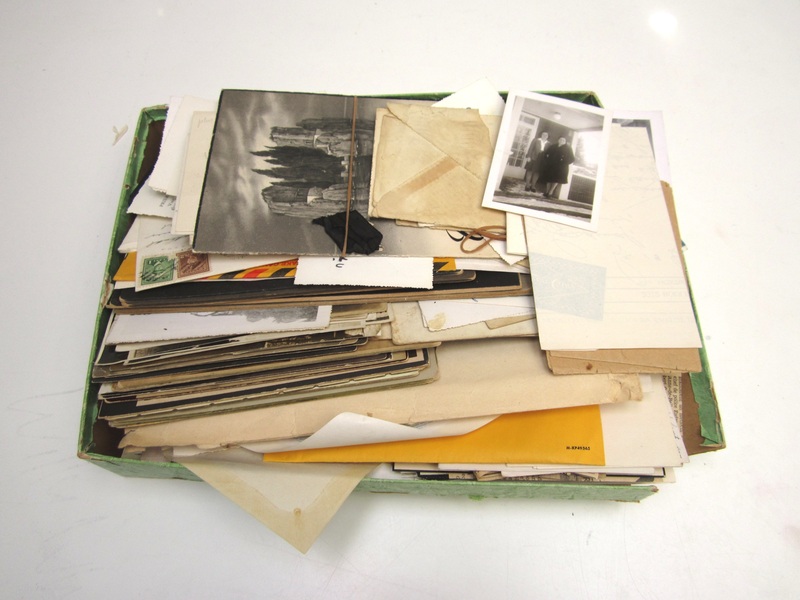 Another bag contained a collection of old photos, as well as many photocopies related to genealogy. 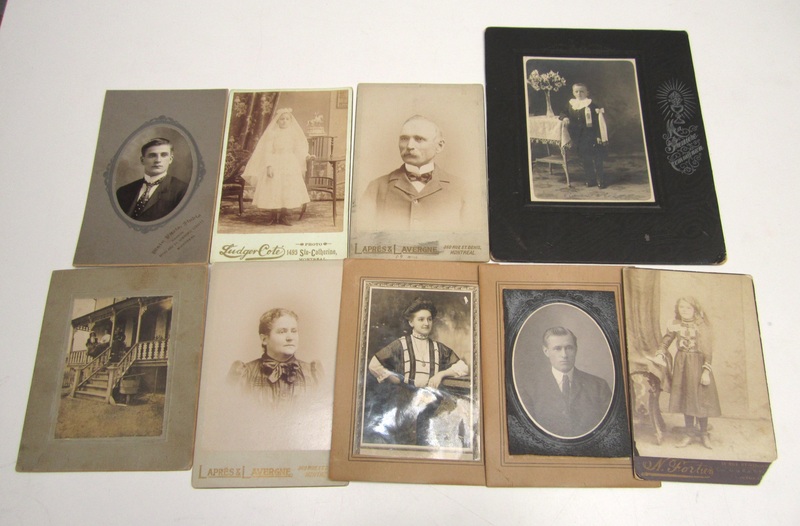 It was apparent that someone put a lot of effort into researching their family history. 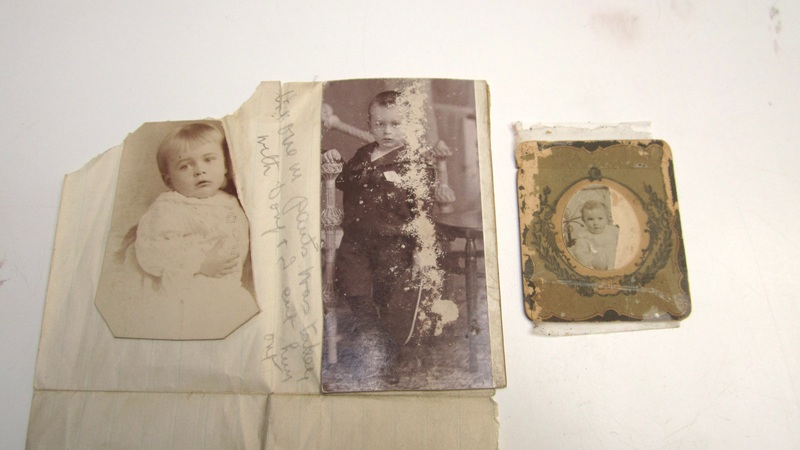 The two photos on the left were glued to a piece to paper. 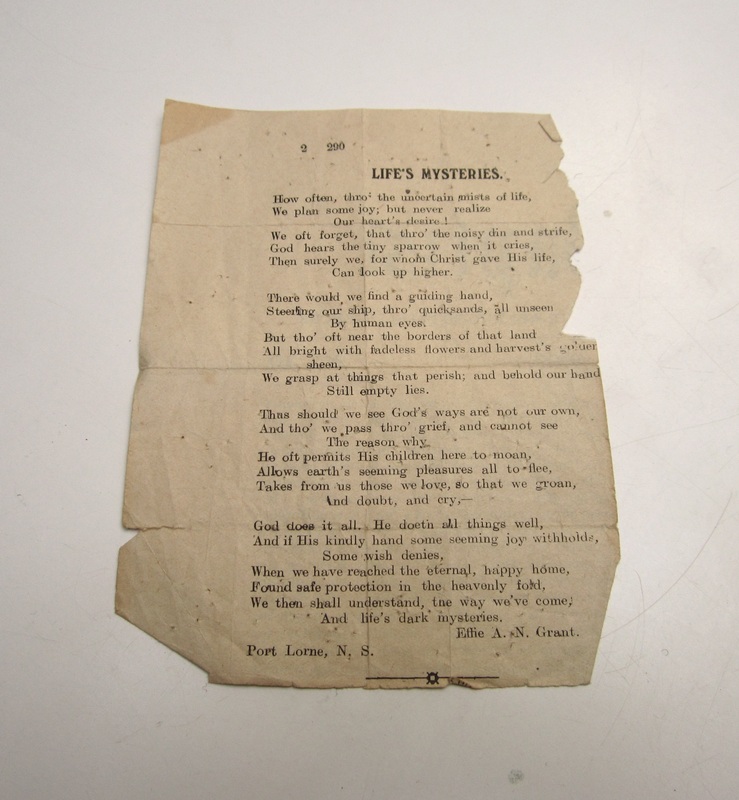 They were printed on cardboard, as was the style in the late 1800s and early 1900s. 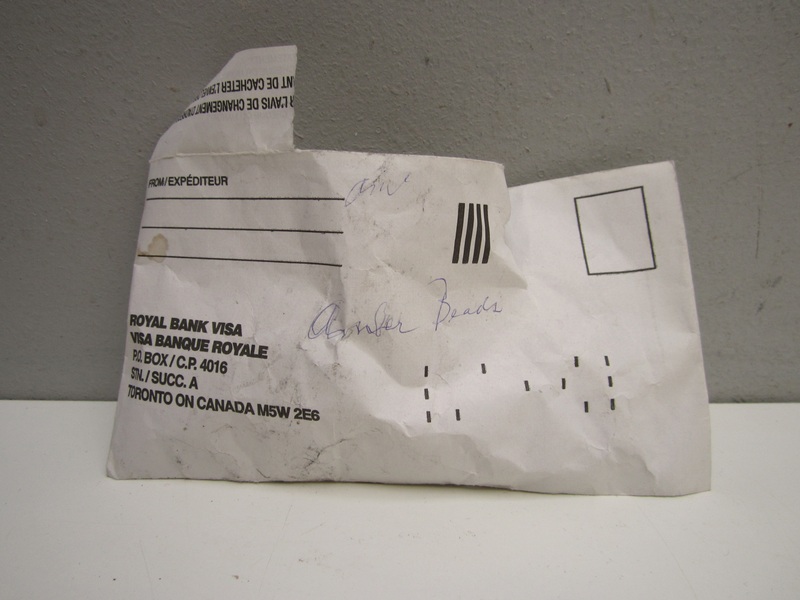 The note says “the one in parts was taken with (Dony?) and I cut him out.” The photo on the right has clear tape on the top and bottom, which can’t be taken off without ripping the paper. I could trim off the bits that aren’t attached, though. 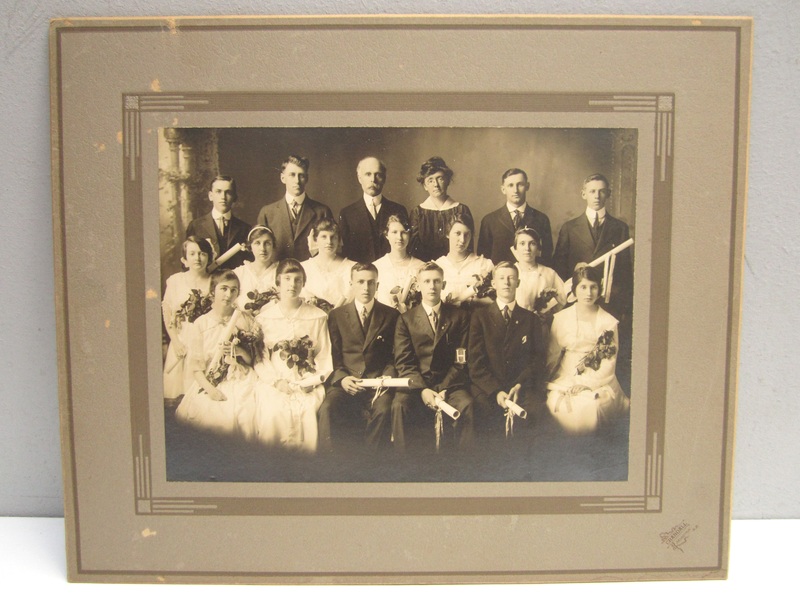 There was an old family portrait, as well as a photocopy of this same shot. 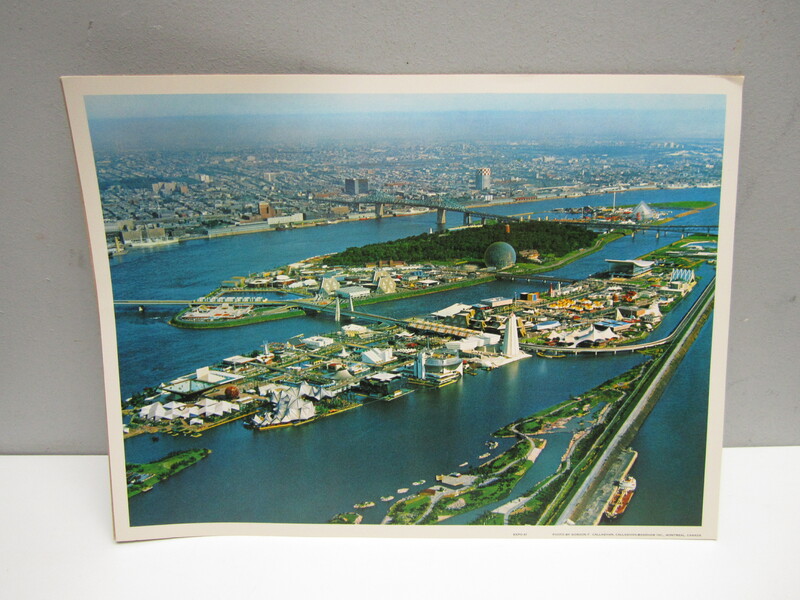 This old postcard has an address in Yonkers, New York written on the back. I looked it up and the house looks more or less the same! I wonder what the (presumably new) owner would think if they got this in the mail. 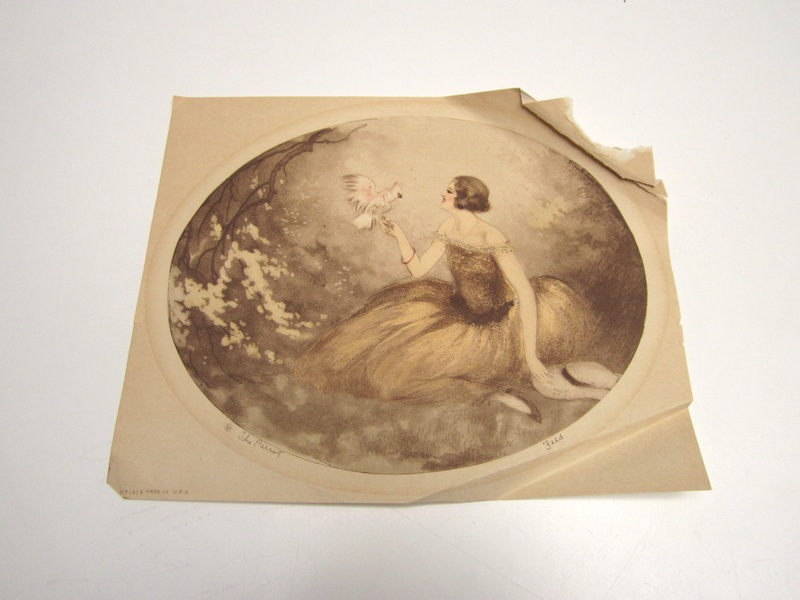 Another old postcard was my favourite find of the week. 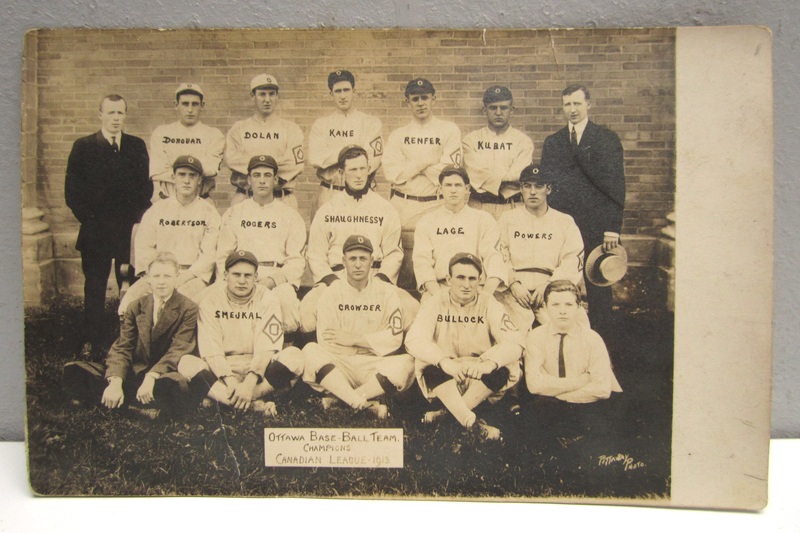 It features a group shot of the Ottawa “base-ball” team that won the Canadian League championship in 1913. The Canadian League was a minor league that operated somewhat intermittently from the late 1800s to early 1900s. It was largely based in southern Ontario. The most notable individual in the photo is likely Frank “Shag” Shaughnessy. Shaughnessy had a long career in several different sports, not only as a player but also as a manager and executive. He was inducted into the Canadian Football Hall of Fame in 1963, the Canadian Baseball Hall of Fame in 1983, and the McGill University Sports Hall of Fame in 1997. The annual football game played between McGill and Concordia Universities is called the Shaughnessy Cup in his honour. He served as a player-manager on this Ottawa team, but also worked for the Ottawa Senators, Detroit Tigers, Montreal Royals, and many other teams. It was just the other day I posted to Facebook expressing my hope to find more baseball related stuff this year! This is definitely the sort of thing I’d keep if I were rich, but I’m definitely not there yet so I’ll likely end up selling it. 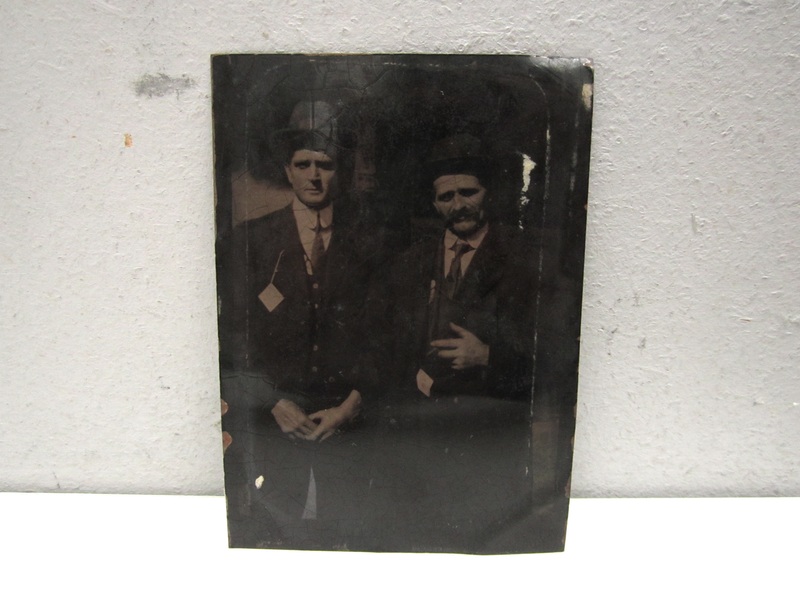 This postcard sold for 25$, despite the fact that it was sold at auction (which is rarely the best way to make top dollar for your item) and features unknown players on a obscure league. I’d start this card at 100$, maybe a little bit more and adjust the price if it takes a while to sell. 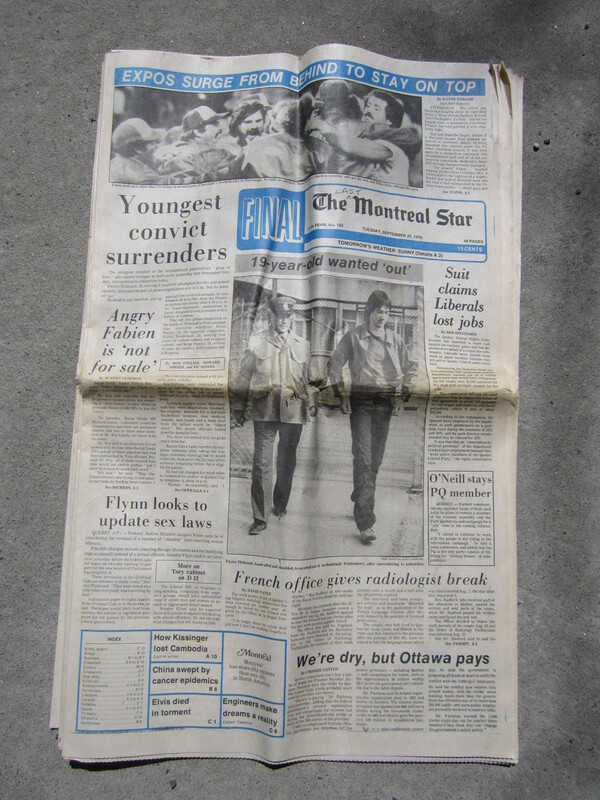 and the last edition of the Montreal Star, which was one of Montreal’s most popular English newspapers from 1869 to September 25th, 1979. Note that someone added the word “last” to the newspaper’s title. Maybe I’ll see if I can get anything for it on eBay. I also have the last postscipt edition. This week has been super busy so far. If it keeps up, I might have to divide it all into two posts! And to think it’s not even the end of the month. I’ve been doing more Facebook posts recently, many of which features finds that didn’t quite make the blog. I don’t like making posts too long, so this is a good way get those “bonus finds” out there. 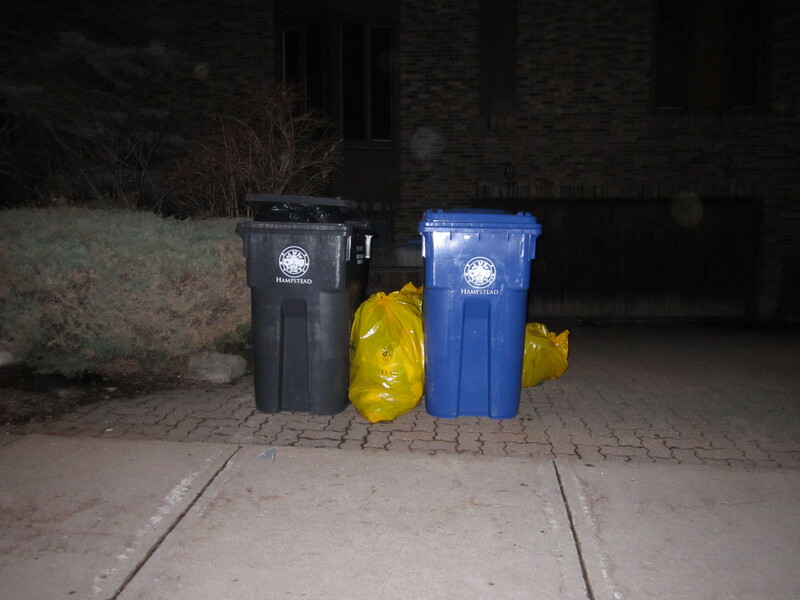 I’ve also been more active posting links related to garbage and recycling. You can see my Facebook page here (and you don’t need a Facebook account to check it out!). 1. Yard sales: 473.75$ (206.50$ on Saturday, 267.25$ on Sunday). My first yard sales of the season went off without a hitch! I unloaded a lot of stuff, which felt great after being stuck with it all winter. I sold alongside a couple of friends who were moving, which was fun. Thanks to the readers that came to check it out! I’ll likely have another in a few weeks. 2. Minolta motor drive: On eBay for 25$. Sometimes I sell things not really knowing what they do. All I know is that it was camera related, and that I’d had for a while. 3. 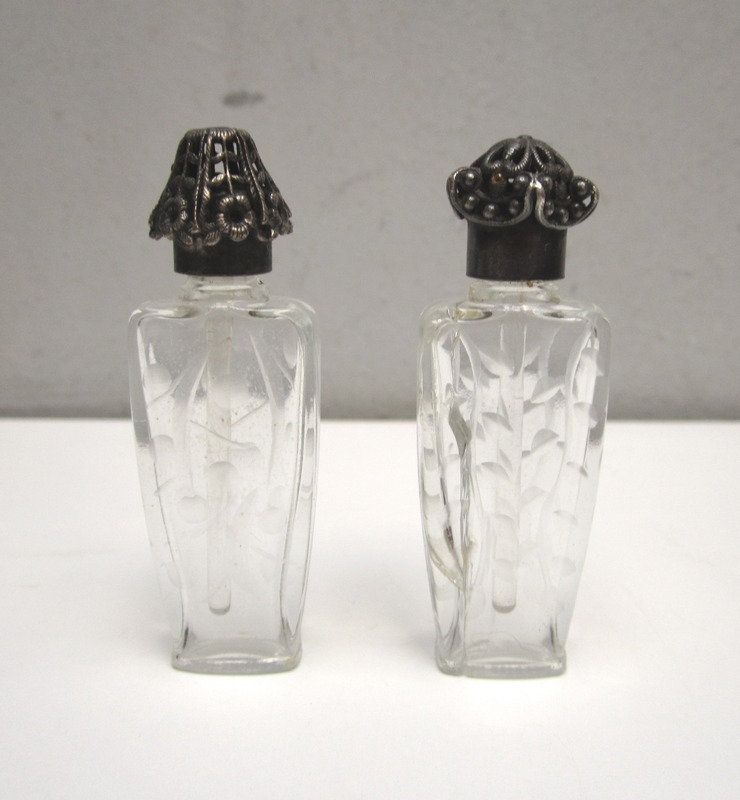 Two La Castillere minature perfume bottles : On eBay for 67$. The customer has since sent me a message asking for a partial refund (half) due to the fact that one of the bottles was broken. 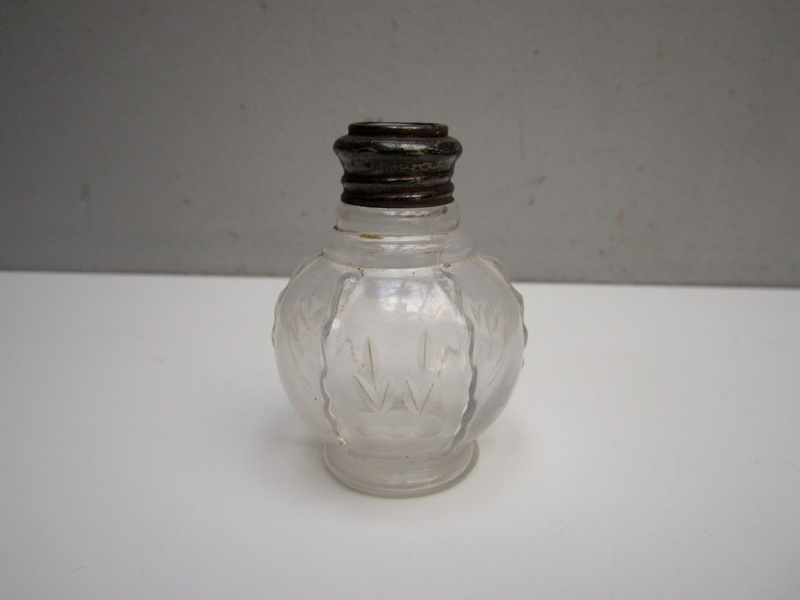 However, the bottle was cracked when I found it and I made sure to mention this defect in the listing details. I guess she just didn’t read them! I offered to refund her 15$, but noted that the item was in the condition I described. That was Sunday night, and now it’s Wednesday afternoon so maybe she realized her error. Regardless, I’ll let you know if I end up refunding any of the total. 4. Vintage Telefunken Partner 500 shortwave radio: On eBay for 100$. This is a nice little radio! I had it for a while before finally listing it in November. 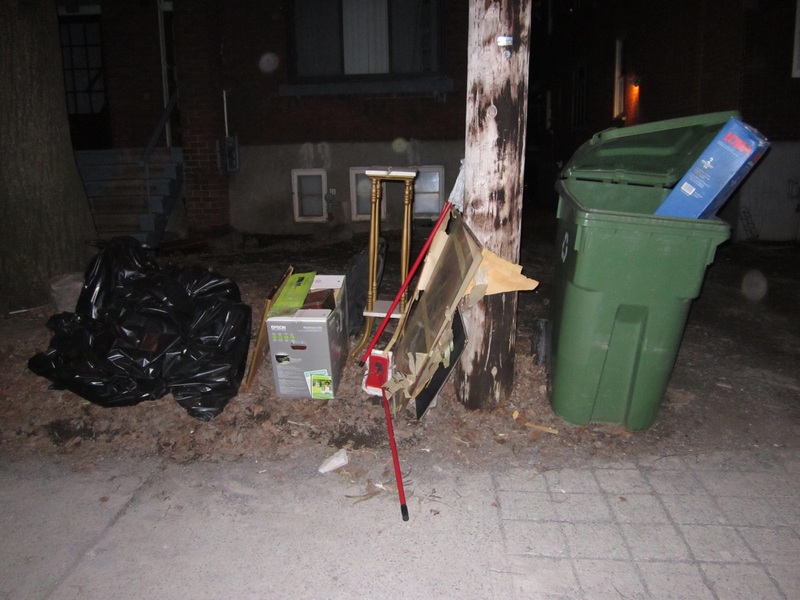 I think I found it along with a bunch of other electronics in Outremont back in September of 2013, but I’m not sure. 5. Signed 1969 "Temptations" program : On eBay for 75$. Found in Snowdon in May of last year, though it was only listed in the past couple of months. 6. 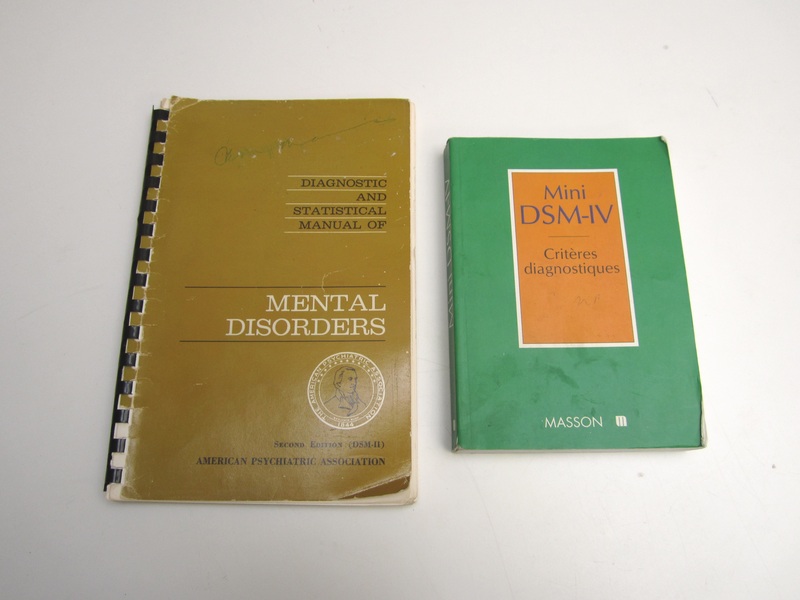 DSM II (1968): On eBay for 280$. A nice sale! Found nearly a month ago in Mount Royal. 7. Silver ring (40$), strawberry shaped rhinestone brooch (20$): to a reader for 60$. She saw them on Etsy, but since she lived not far away I was able to deliver them myself. I found the ring in Rosemont a couple summers ago, while I don’t remember exactly where the brooch came from. 8. Vintage micro-mosaic pendant: On Etsy for 24$. Found at that same spot in Rosemont. Total: 1105.75$, 15180.75$ since May 18 2014 and 5497.75$ since the new year began. A great week! Being able to have yard sales definitely the profit margins. This was my first week of four figure profits since around Christmas. It’s looking like I’ll make around 16k for the year (ending May 18th, when I started keeping better track in 2014). It’s below the poverty line, but I’m still pretty proud of the achievement. I basically make as much as I would doing full-time minimum wage work, but I’m saving really cool stuff from destruction, doing my part for the environment, and above all doing something I love. With my relatively low expenses, I’ve been able to live comfortably, if not luxuriously, which is good enough for me. I’m hoping to crack 20k this year. From the early going, it looks like I’ll have a good chance! That’s still not a tonne of money or anything, but it would put me above the poverty line. 2. 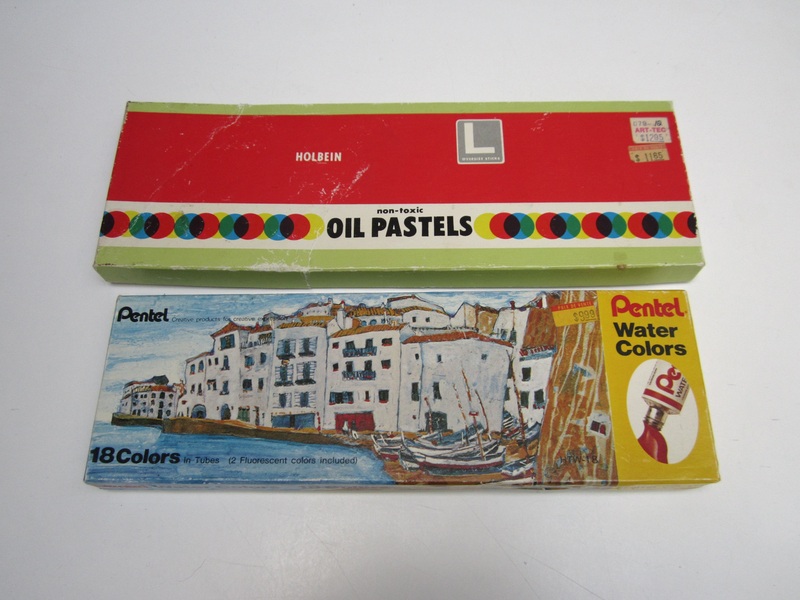 1970s Parti Quebecois election sign + folk art mural (I priced this high partly because I like it so much. I wasn’t able to find anything similar for sale on the internet, but I’m guessing there’s a market here. Whether or not that market will pay 300$, that’s another thing. I can always lower my price later, though). 5. 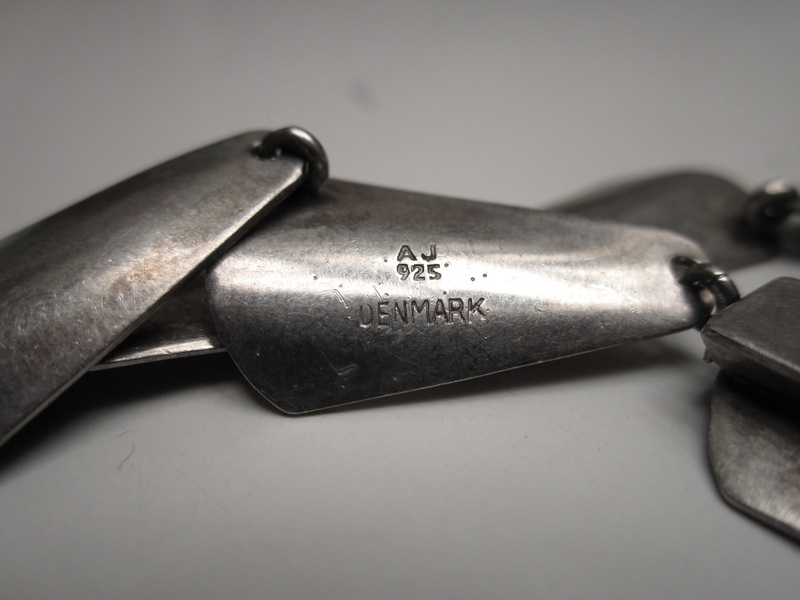 Vintage Arne Johansen Danish modernist ewelry set (Currently the most expensive thing I have listed on eBay). Spring is finally here! 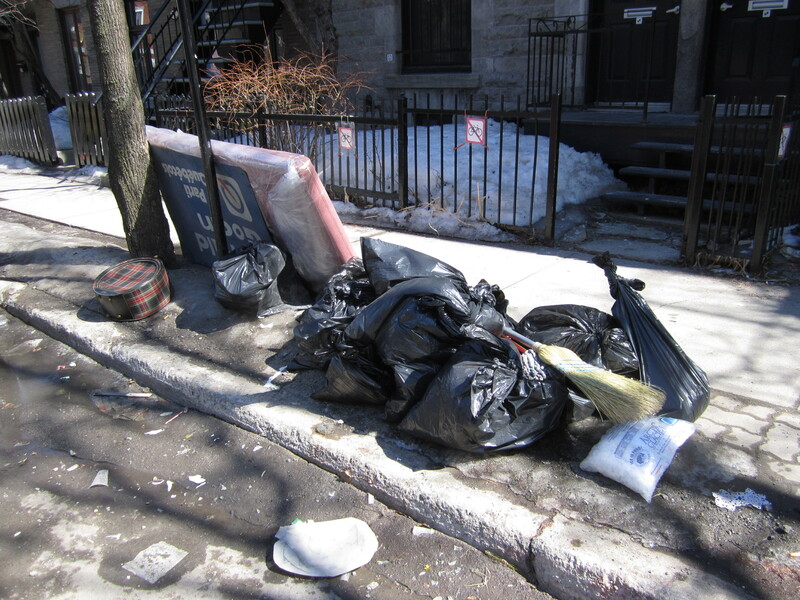 It’s definitely a lot more fun to look for trash when it’s warm out. Not only does it make sorting through bags easier, but it inspires people to get organized (which often involves them tossing out their old, unused stuff). 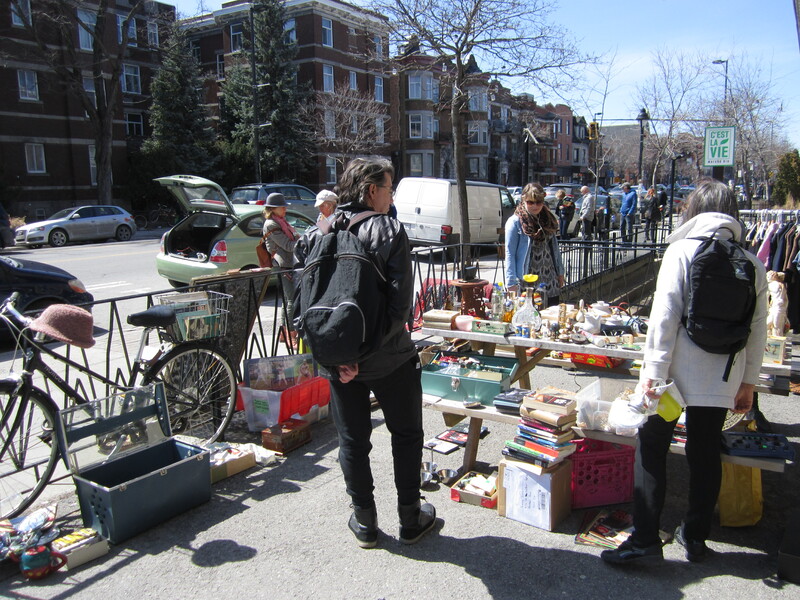 The arrival of spring also means that I’ll again be able to do yard sales. 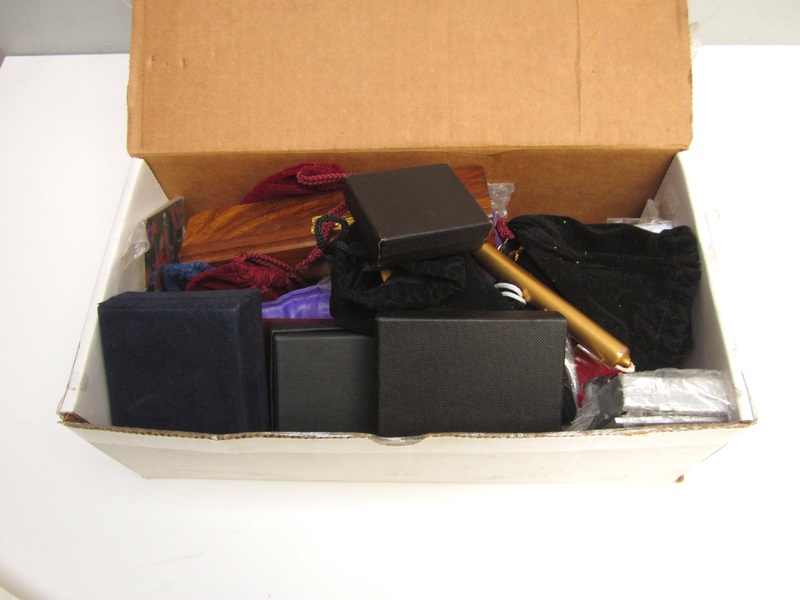 I look forward to unloading some of my stuff, as I’ve been collecting without a real outlet (outside of eBay, of course, but I use that mainly to sell only the more valuable items) since the end of October. I’m aiming to do one, or maybe even two sales this weekend – the forecast is calling for sunny skies, 12 degrees, and low wind. If everything works out, I’ll post the location on my Facebook page. This spot in Hampstead produced a few interesting finds. 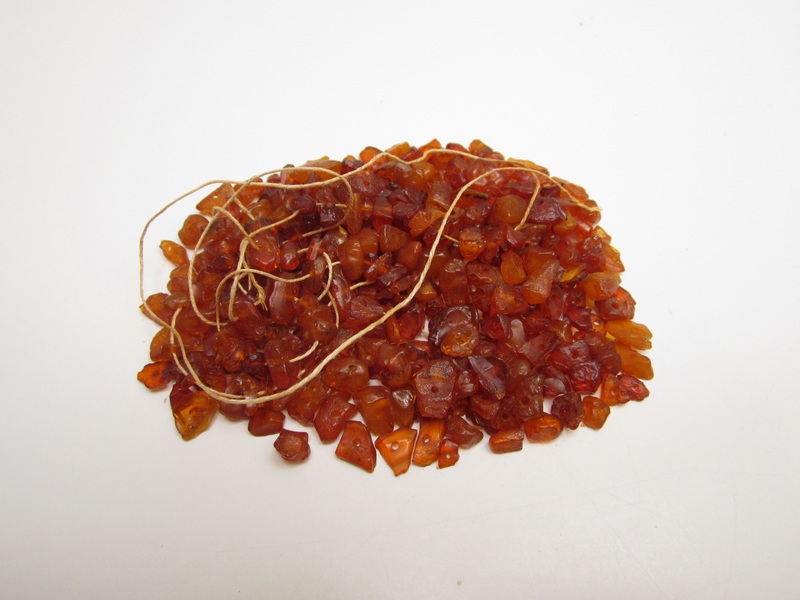 A few small things were floating around near the bottom of a bag. 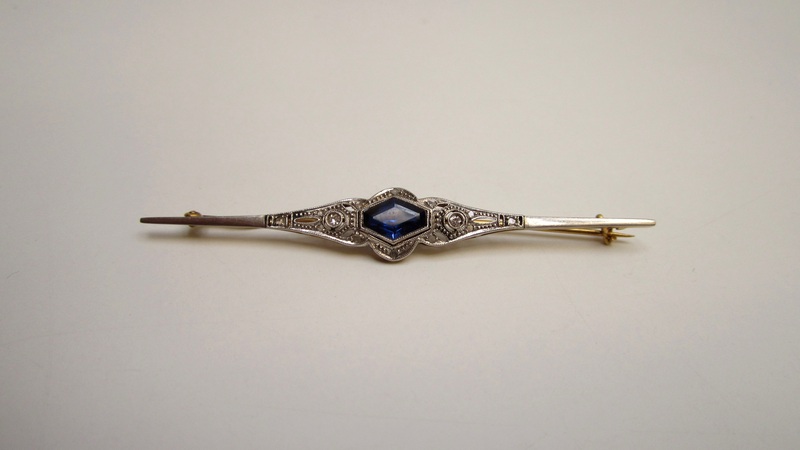 None of it was particularly noteworthy, outside of this brooch (about 3″ long, for reference). There’s a mark on the pin, which looked indecipherable at first but upon further inspection looks like an incomplete 18k mark. My acid test supports that theory, though I’m still not 100% confident in my ability to test gold. Either way, it looks and feels like a nice piece. The front is white and shiny, hopefully a thick layer of white gold on top of the yellow back. 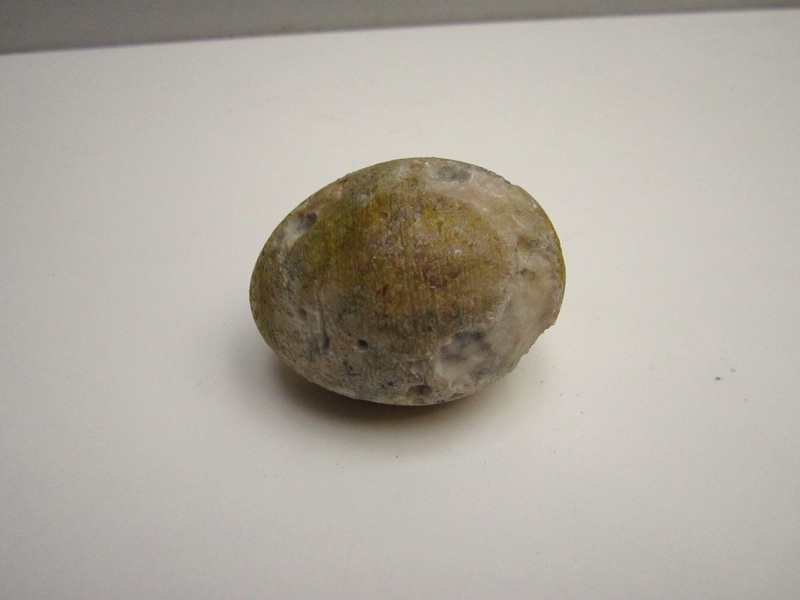 There is one larger blue stone, and several clear shiny stones, which could be diamonds. I think I’d have to get an expert to look at it to be able to really know what it’s worth. 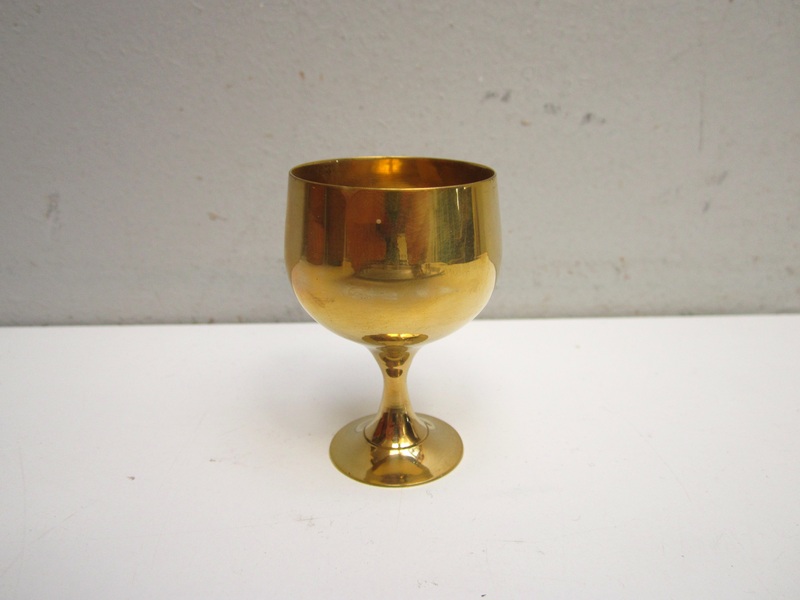 If it really is 18k gold, it could be a nice get. 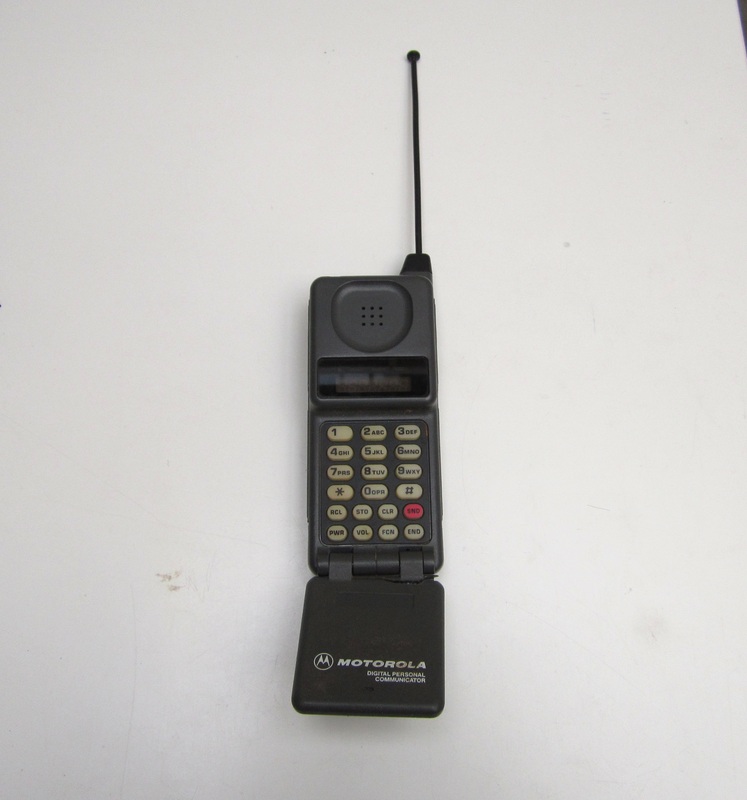 I also saved this ancient mobile phone. 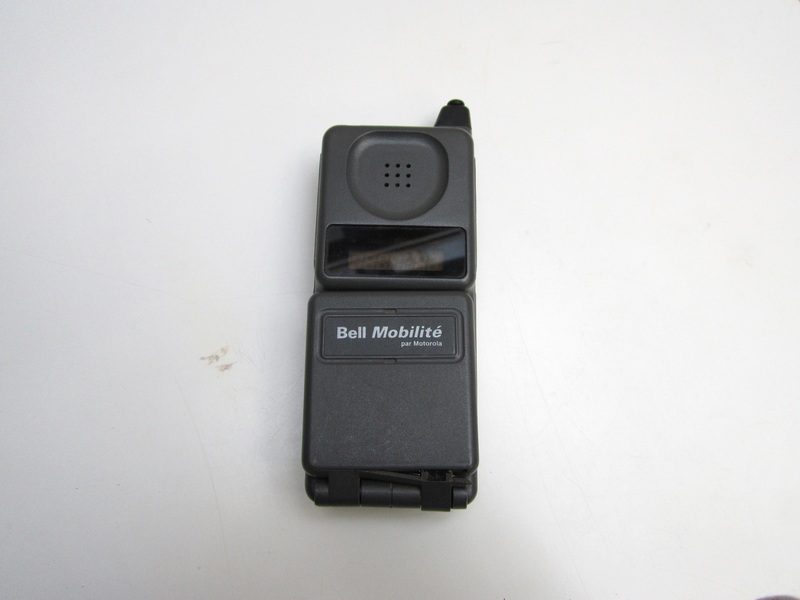 Some vintage cell phones are actually worth a lot of cash , though I don’t expect that this one in particular is valuable. The hinge of the receiver is cracked, and there’s no charger to test it with. It’s a fun yard sale piece. 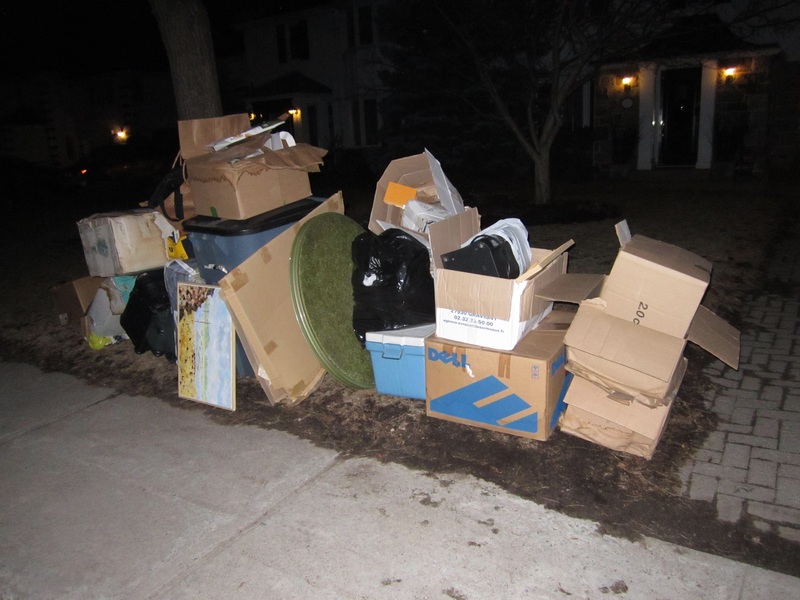 On Tuesday a reader sent me an email to tell me that his neighbours were throwing out a bunch of stuff. 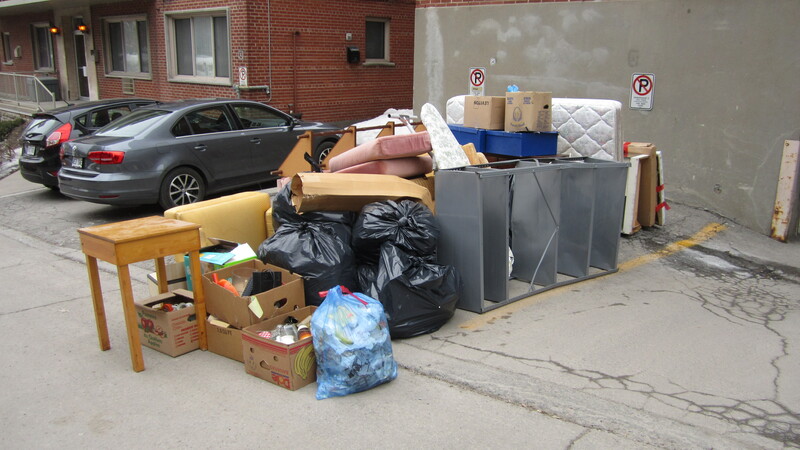 Before I got there, however, they apparently got one of those junk removal companies to pick up the bulk of it, perhaps thinking the city wouldn’t take it all. Still, a few things remained, and I found something cool leaning up against the post in the background. It was a large (about 4′ x 2.5′) Parti Quebecois election sign. 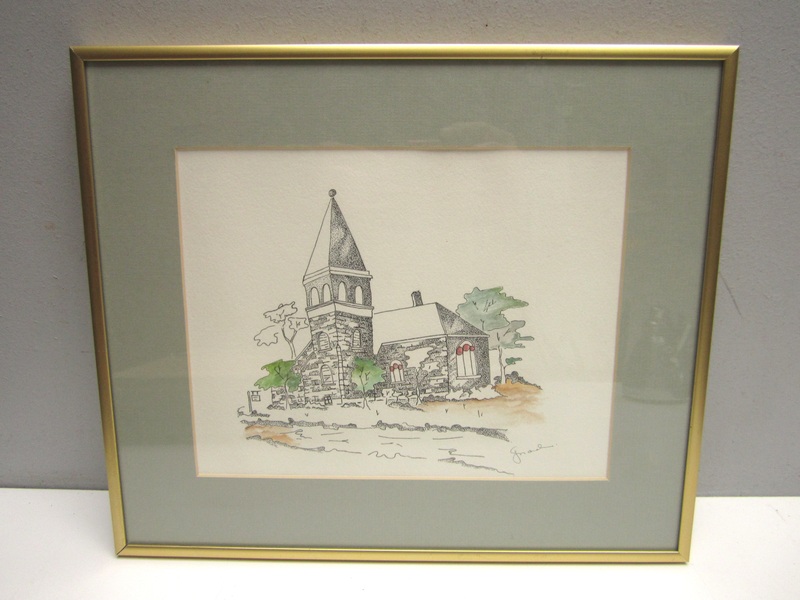 It bears the name of Gérald Godin, a poet and MLA in Mercier (Plateau) from 1976 to 1994. One of his poems is painted on a wall near Mont-Royal metro station – see a photo of the poem here. However, my favourite part of the sign might be the painting on the back. 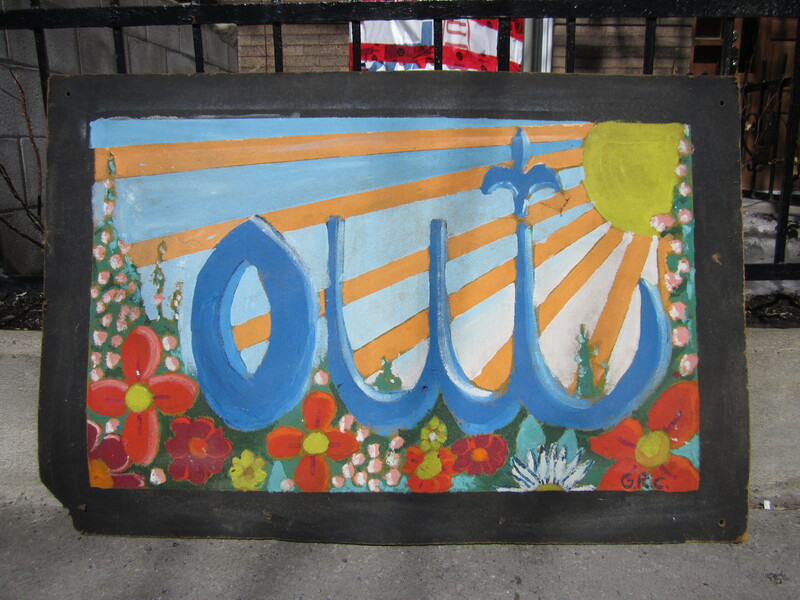 It depicts a “Oui” (yes in French) surrounded by flowers and the warmth of the sun. The dot of the I is a fleur-de-lis. 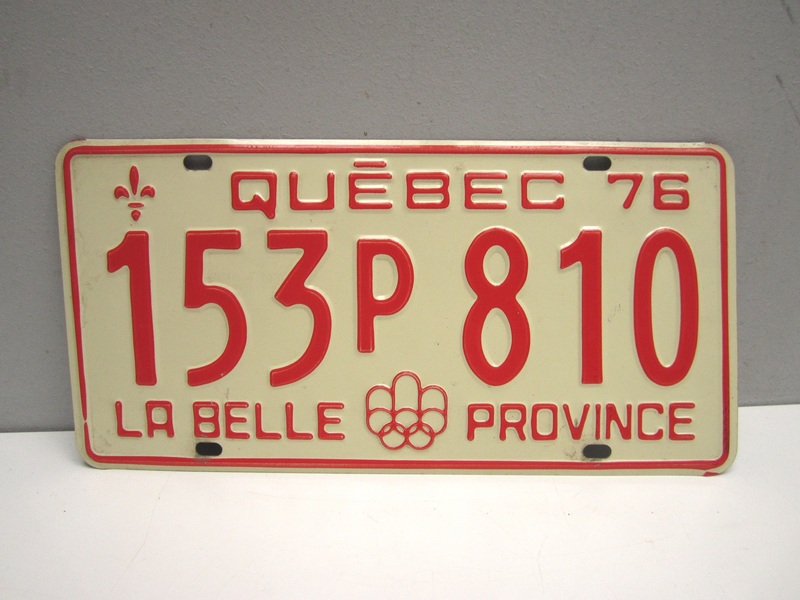 For those who don’t know, the province of Quebec has held two referendums about separating from Canada – one in 1980 and one in 1995 – and “Oui” was what you would have voted if you wanted Quebec to become its own country. 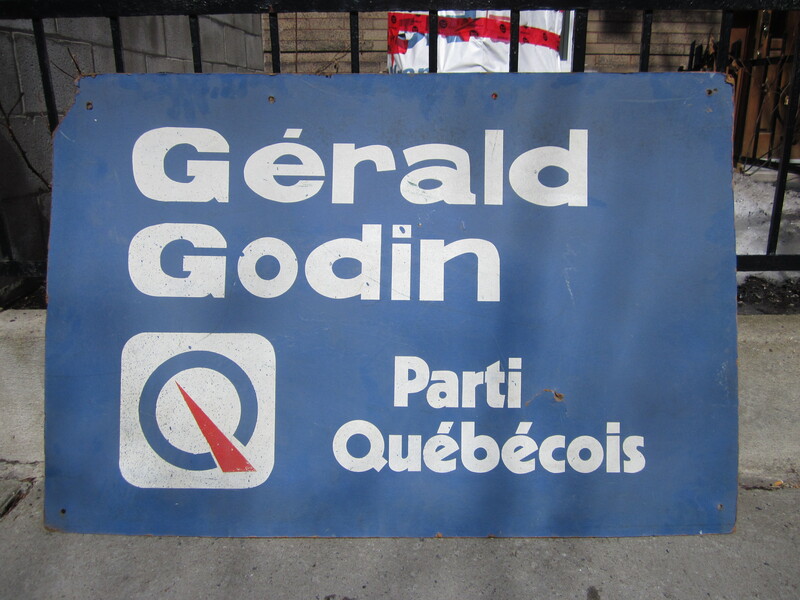 I would guess that this sign would have been made for the 1976 Election, when Godin defeated the former premier Robert Bourassa in his own riding. Someone then saved the sign for four years before painting the mural on the back for the 1980 referendum. As someone with an interest in politics as well as folk art, this is a pretty cool thing! (Just as a reminder, if you ever see a potentially good trash spot, but can’t or don’t feel like picking it yourself let me know! It might help me find something I wouldn’t have come across otherwise. I can travel to nearly anywhere in Montreal and Laval, depending on my schedule). 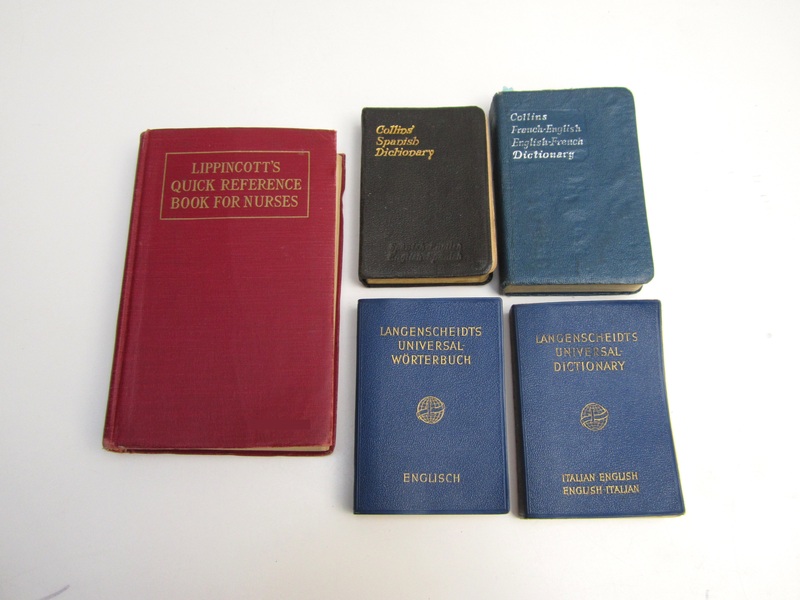 and some books, including a nursing guide and four miniature dictionaries. The dictionaries translate French, German, Italian, and Spanish to English. There were many other books, but none seemed particularly special – mostly softcover romance novels from the 80s and 90s. 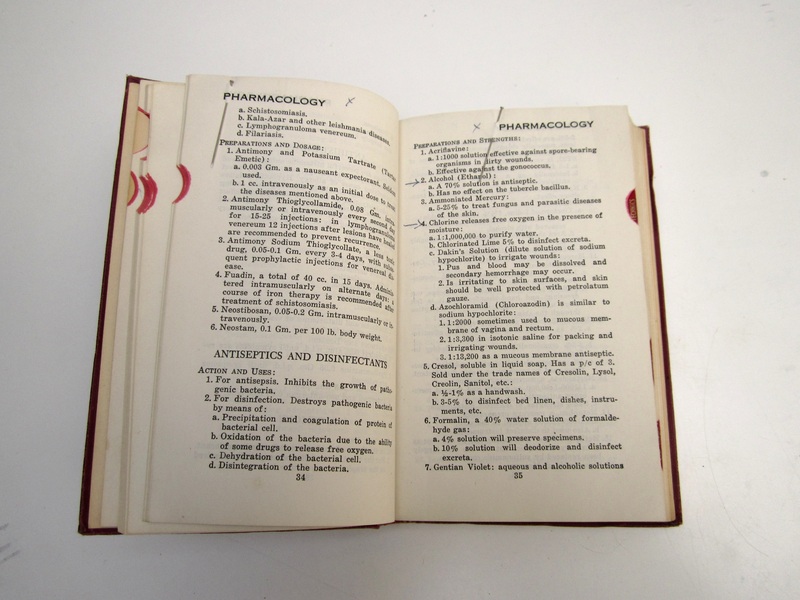 A few pages in the nursing book were bookmarked using pins, which I’d never seen done before. I also saved a few potted plants. They were very dry, but still alive. I gave them water and expect them to recover well. 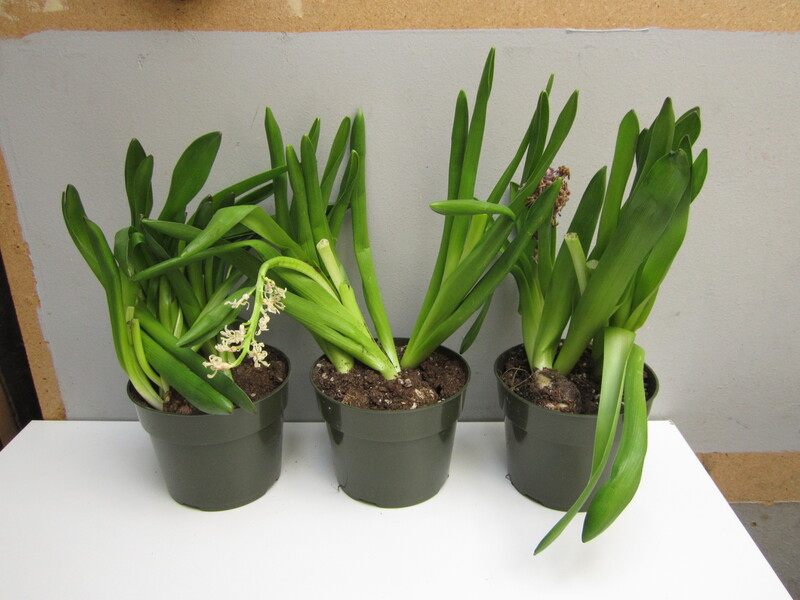 They looks like Hyacinths, which I think can do well planted in the ground. 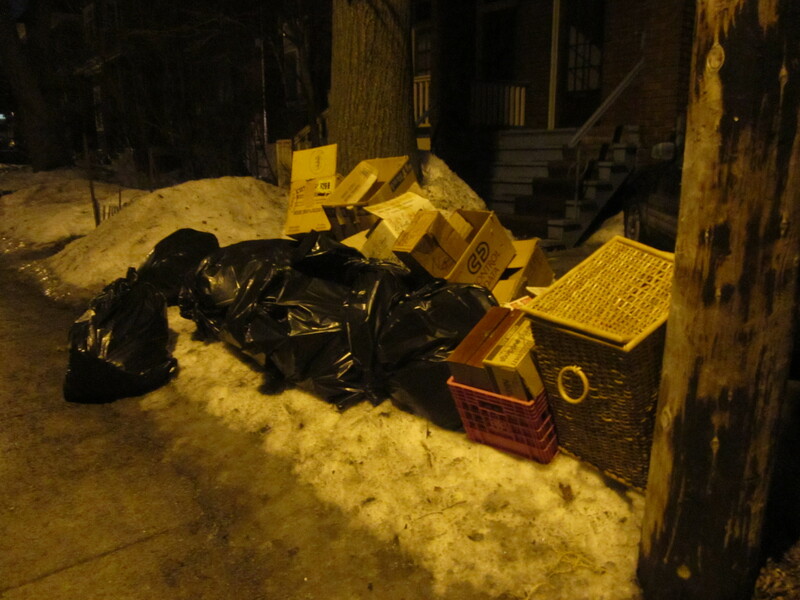 A couple of my best finds though came from my spot in NDG. It didn’t produce anything for my previous post, but the trash started flowing again last week. I thought I saw an old coin at the bottom of one bag. 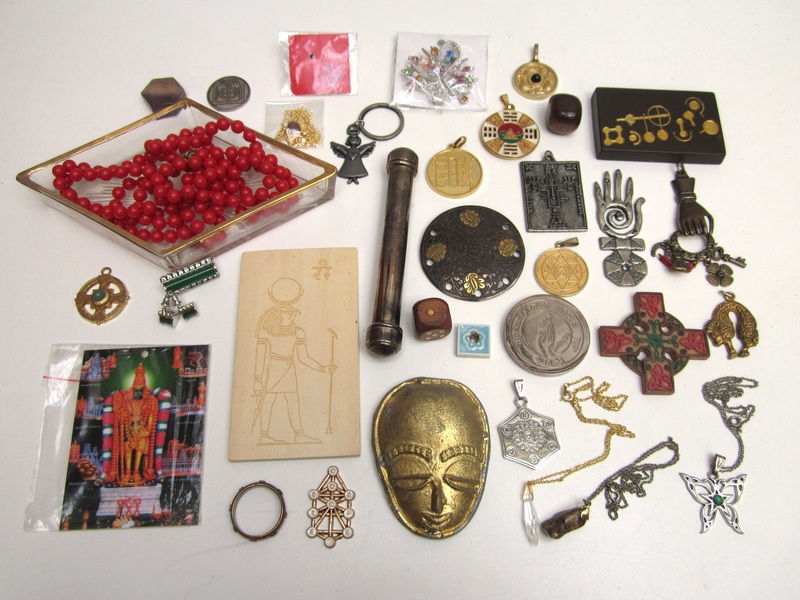 It was only an imitation Roman coin (you can see it at top center), but I pulled out some other interesting pieces, including several new-age pendants. 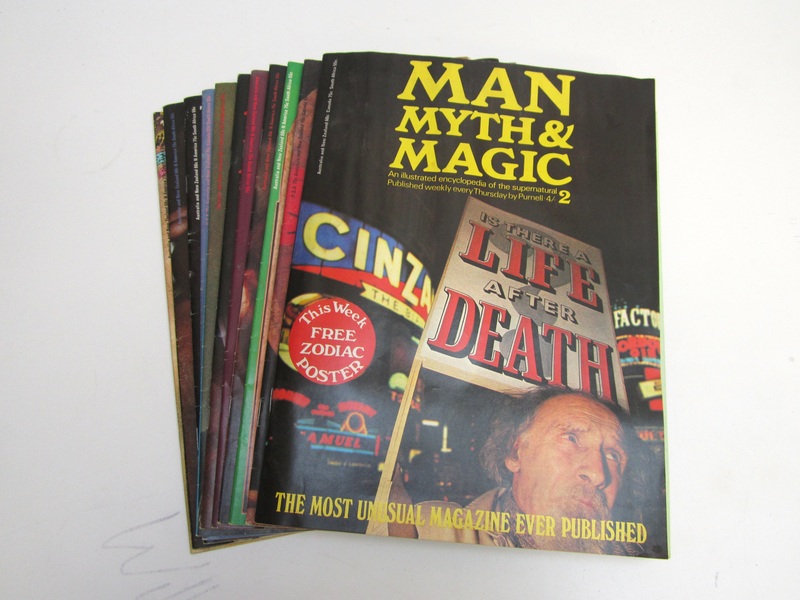 and some editions of Man, Myth, and Magic magazine from the 1970s. 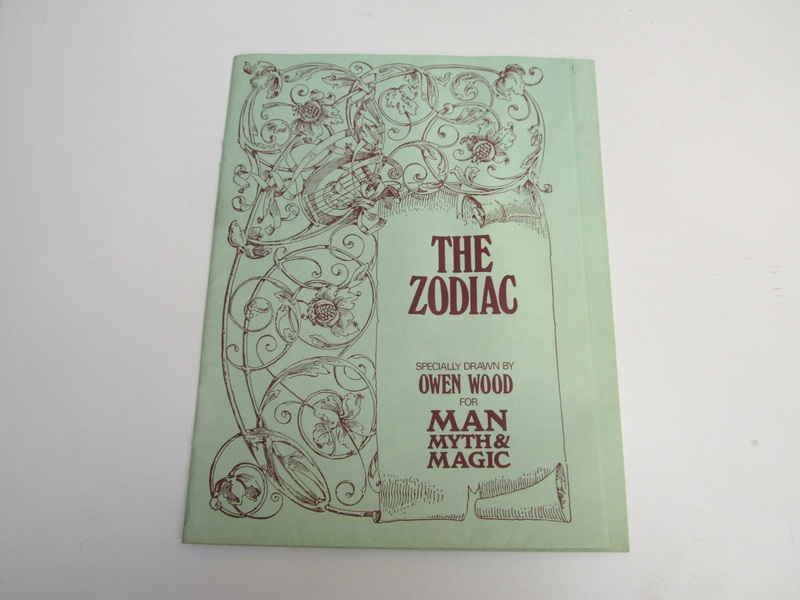 One contained a poster of the zodiac, drawn by a guy named Owen Wood in 1969. It’s pretty cool! There’s not much mention of it on the internet, beyond this short article and a few places referencing it. (The link also has a nice quality scan, which is better than my photo if you wanted to take a closer look). 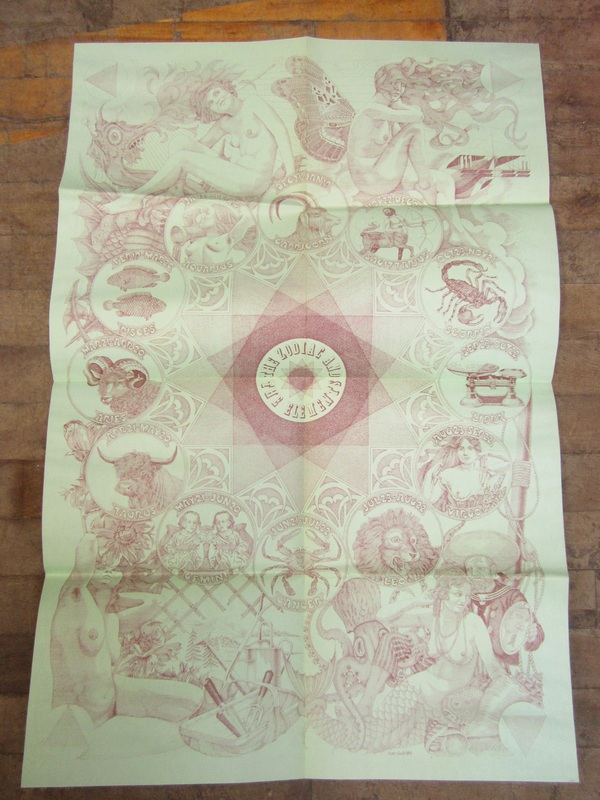 The poster doesn’t seem particularly common, so maybe I can get some good money for it. 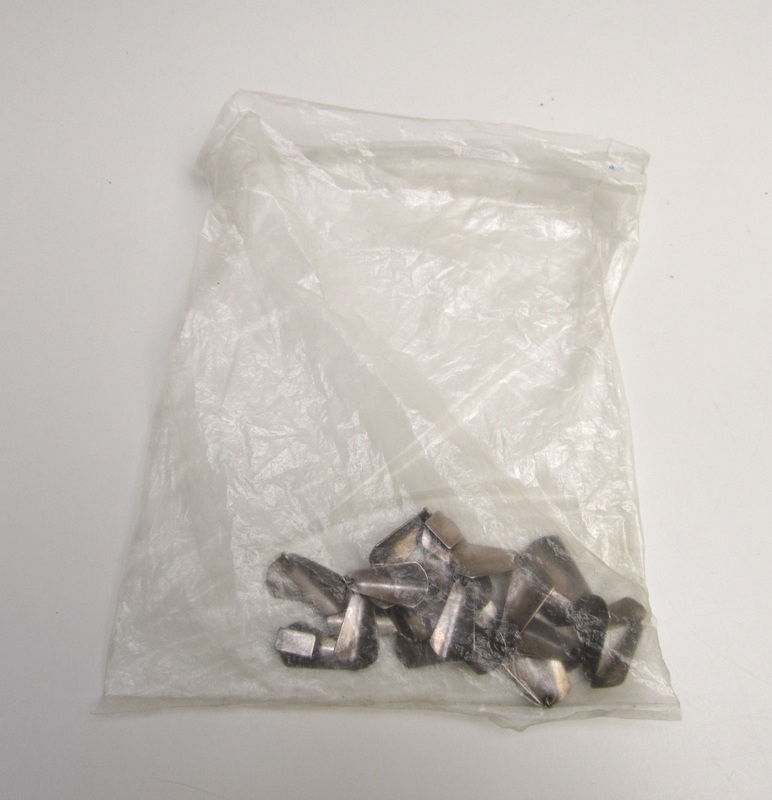 My favourite finds though came from this grubby plastic bag. Inside was a matching sterling silver necklace and bracelet! 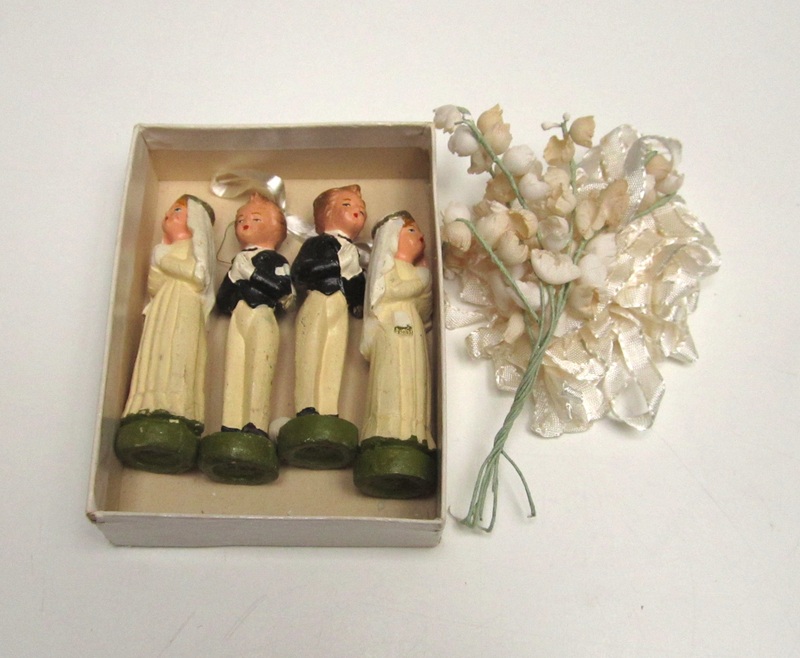 The best part though is that they match the brooch and earrings (picture) I found at the exact same spot a few weeks ago. 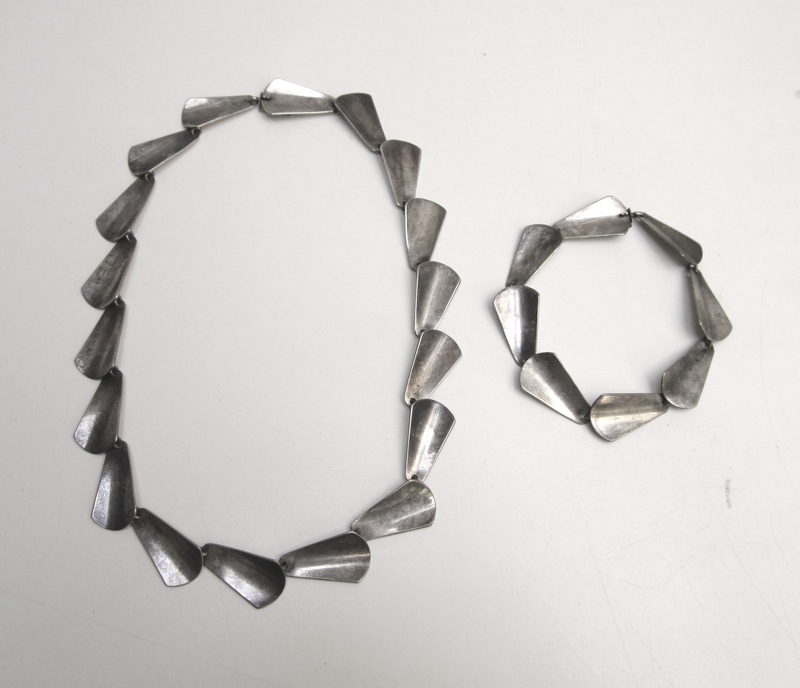 All the pieces are by Arne Johansen, a Danish modernist jewelry designer. 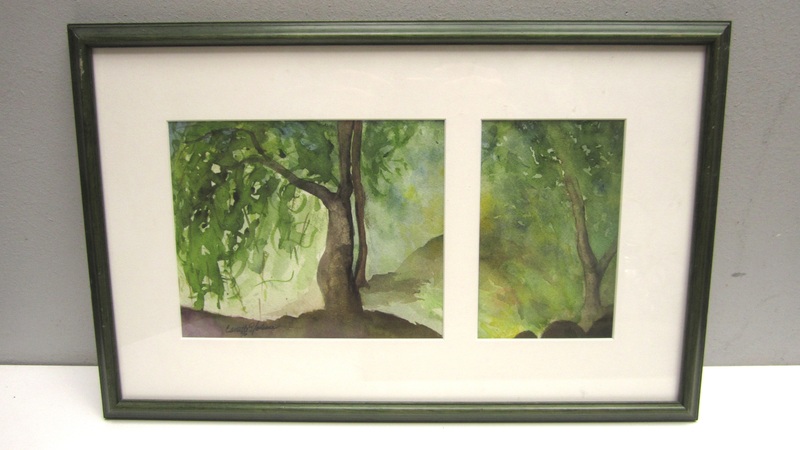 Her work sells for pretty good money on eBay. 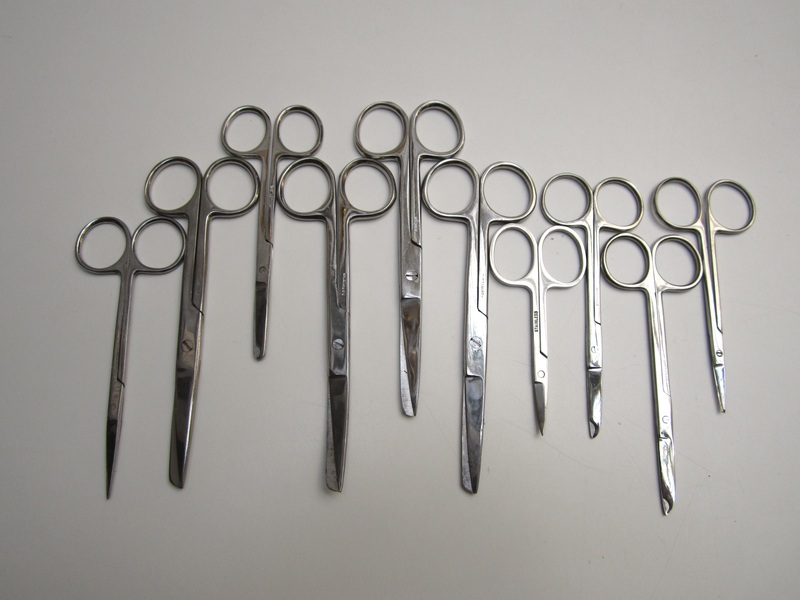 I’m excited to see what I can get for a set, considering that many single pieces are going at auction for between 125 and 180$. My general pricing strategy is to start high and adjust lower, so I plan on starting the set at around 700-800$ and seeing what happens from there. No matter what I end up getting for it, it’s an awesome find! 1. 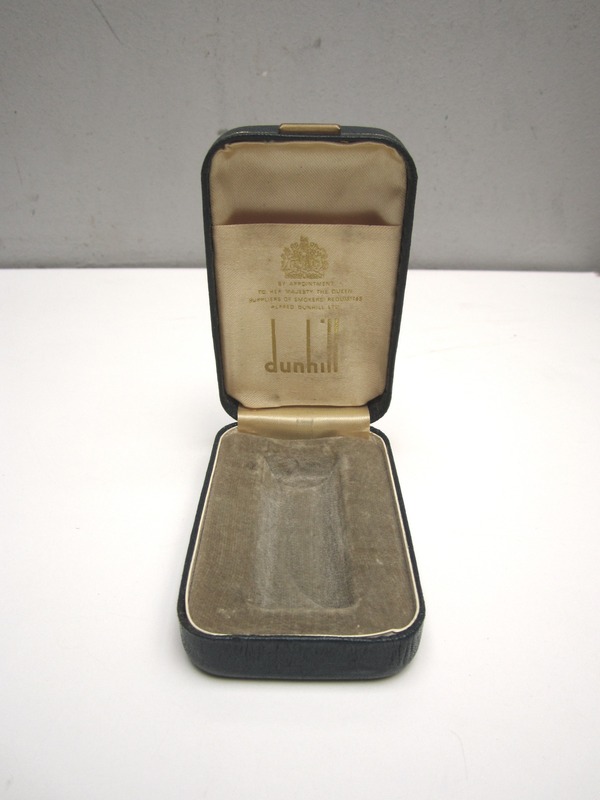 Vintage Dunhill lighter box: On eBay for 52$. Found in Hampstead around a month ago. 2. Harley Davidson belt bucket: On eBay for 11$. 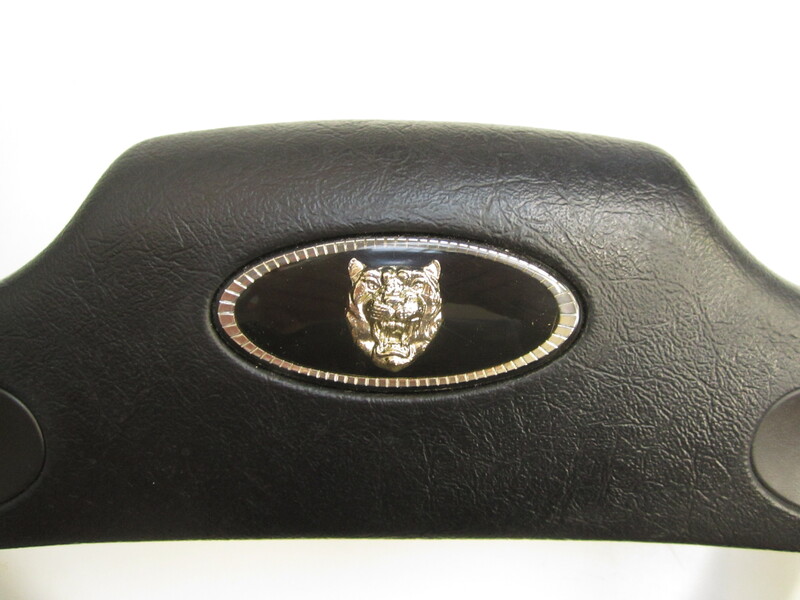 This has been in my eBay store for quite some time. I don’t even remember where I found it, though it might have been in Rosemont. 3. 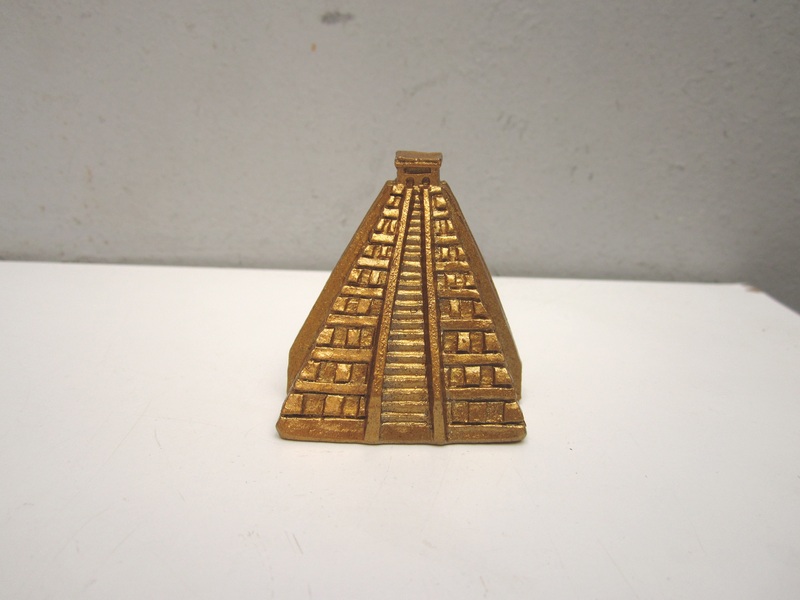 14k gold bracelet, and 10k gold ring: On Etsy for 190$. The ring I found in Rosemont over two years ago, while the bracelet was found in Mount Royal last year. Total: 253$, 14075$ since May 18 2014 and 4392$ since the new year began. Another decent week. 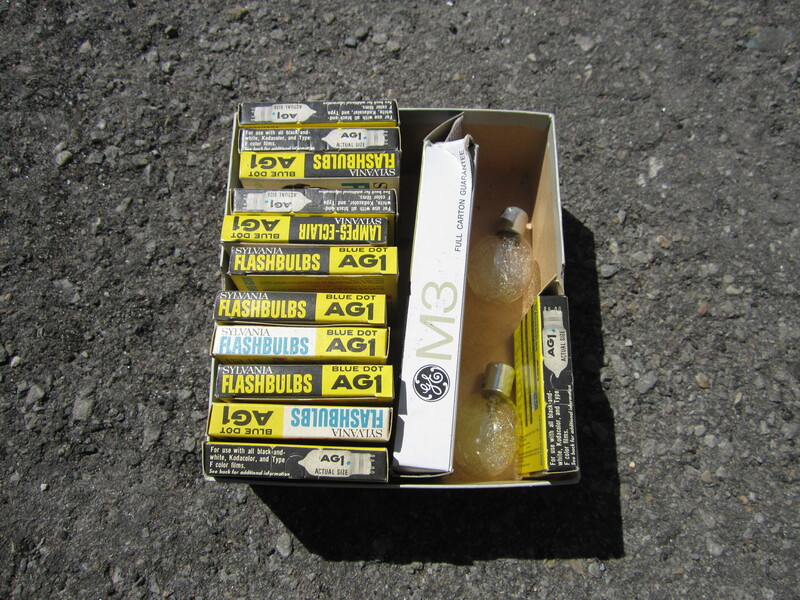 I also sold a vintage thermometer on eBay, before realizing that you can’t ship mercury via Canada Post or USPS. It’s too bad, because it would have made me around 100$. Maybe I can try Kijiji.